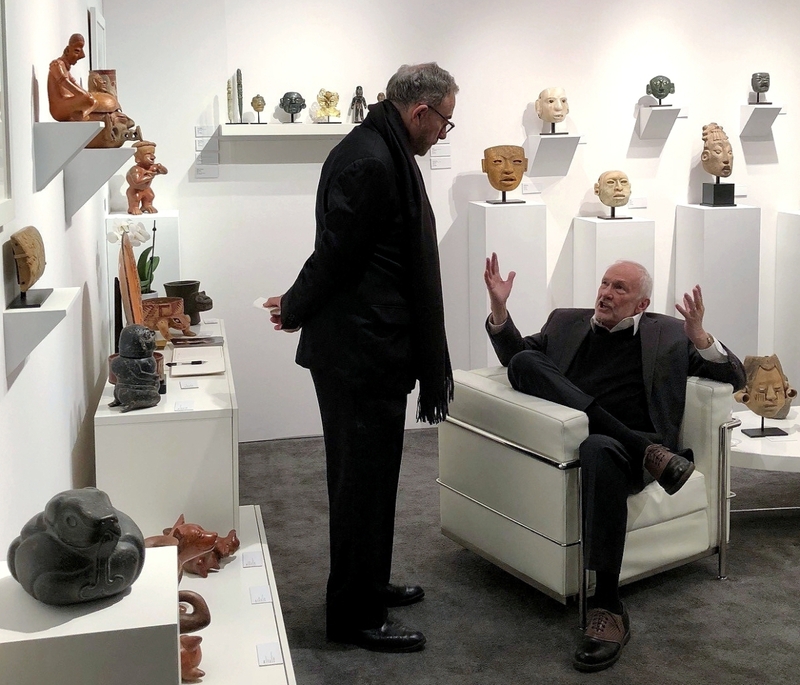 NEW YORK CITY – What are dealers for? 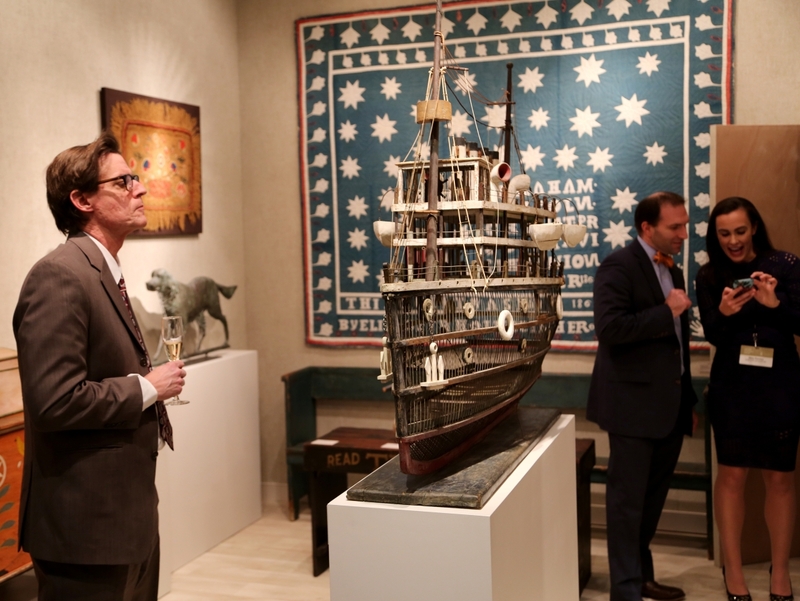 For all its rarified nature, the best place to answer that question was at the 64th Winter Antiques Show, where 70 sole proprietors – a nation of shopkeepers unto themselves – demonstrated with dazzling success their erudition and taste, not to mention the presentation, storytelling and cultivation skills needed to engage discrete audiences of curators, collectors, decorators and the merely curious. 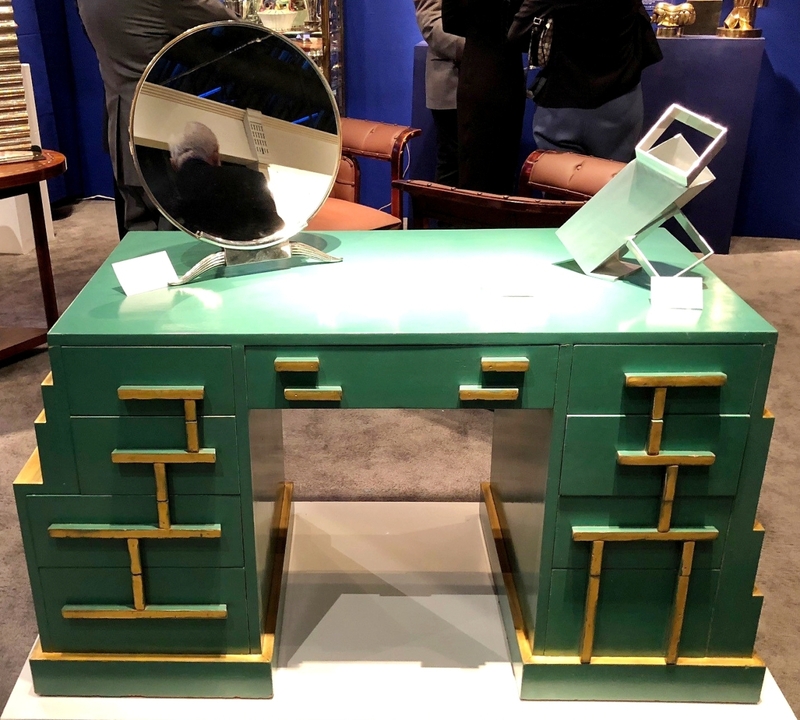 The fair, which wrapped up at the Park Avenue Armory on January 28 after 11 days of selling, perennially reminds us that show business is an ensemble performance, its success down to the talents, ambitions and even eccentricities of individual exhibitors. 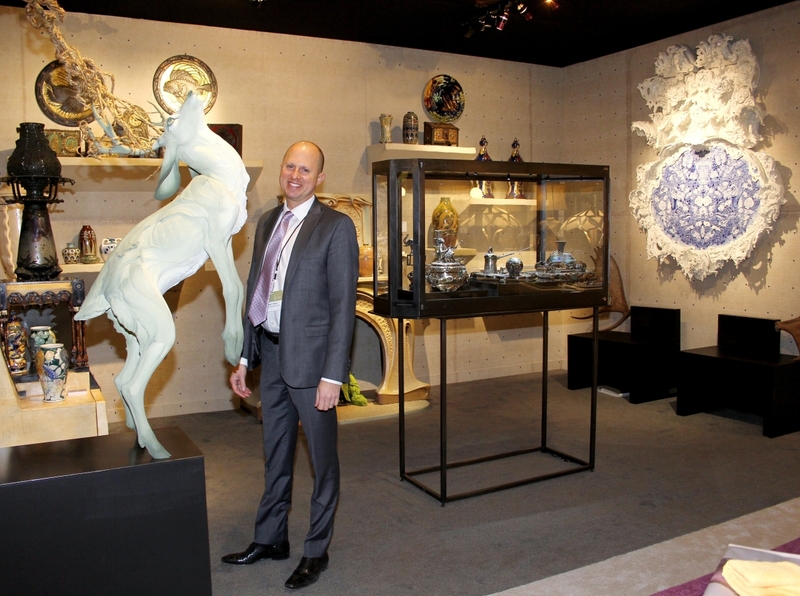 It is often said that without dealers, there is no show. 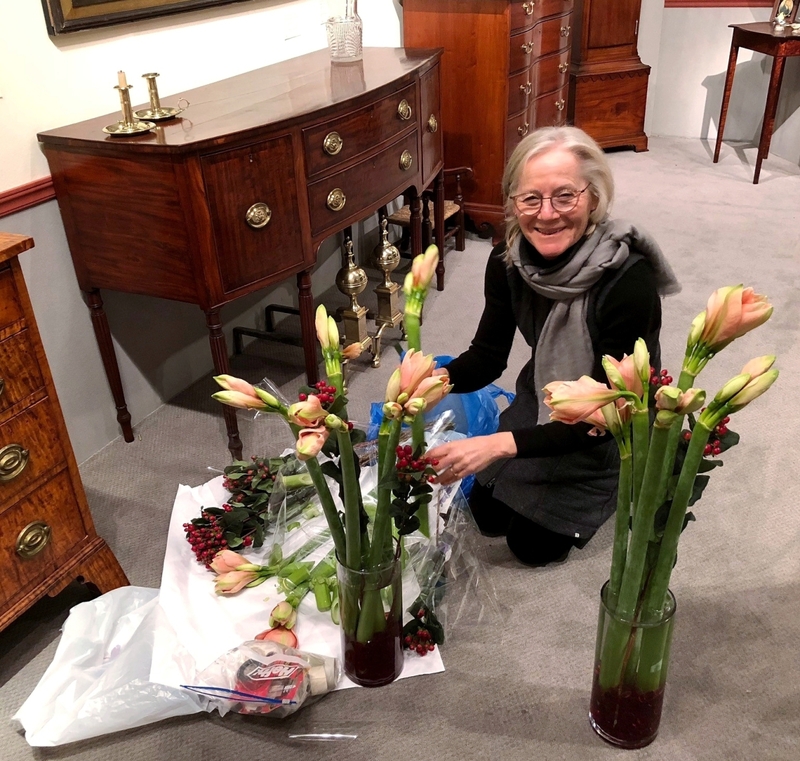 Without skillful management, however, there could be no Winter Antiques Show. 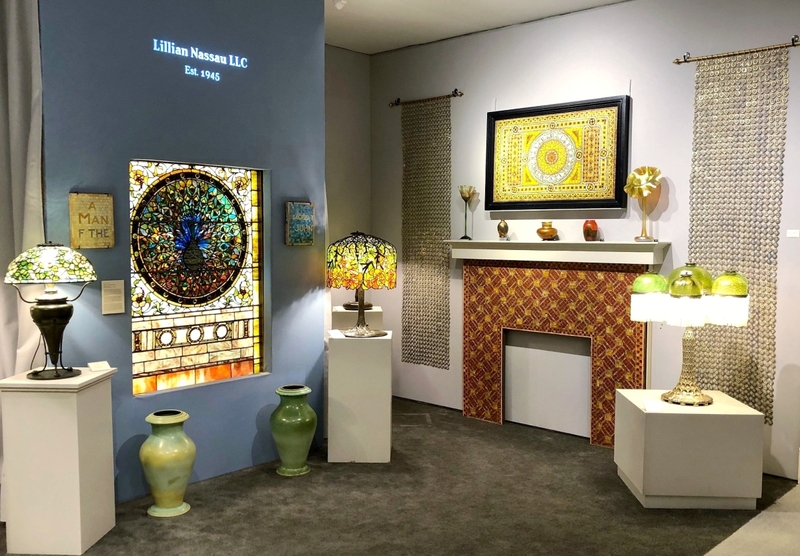 Organizers of the fair, whose profits support East Side House Settlement, exhibit a clear sense of the event’s character, traditions and innate appeal while also recognizing the dangers of torpor in a volatile, competitive marketplace. 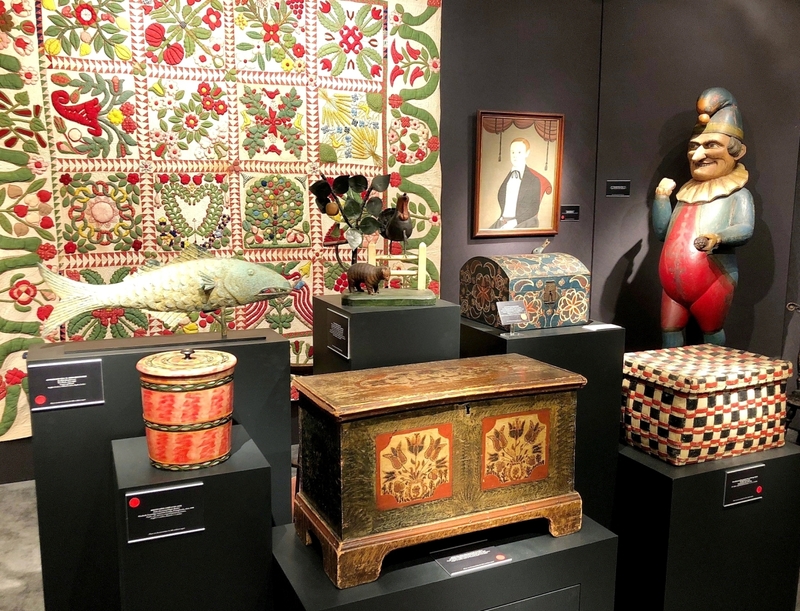 This is not to say that the economics of producing a top show – or exhibiting at one, for that matter – are easy, but the Winter Antiques Show mostly gets it right. 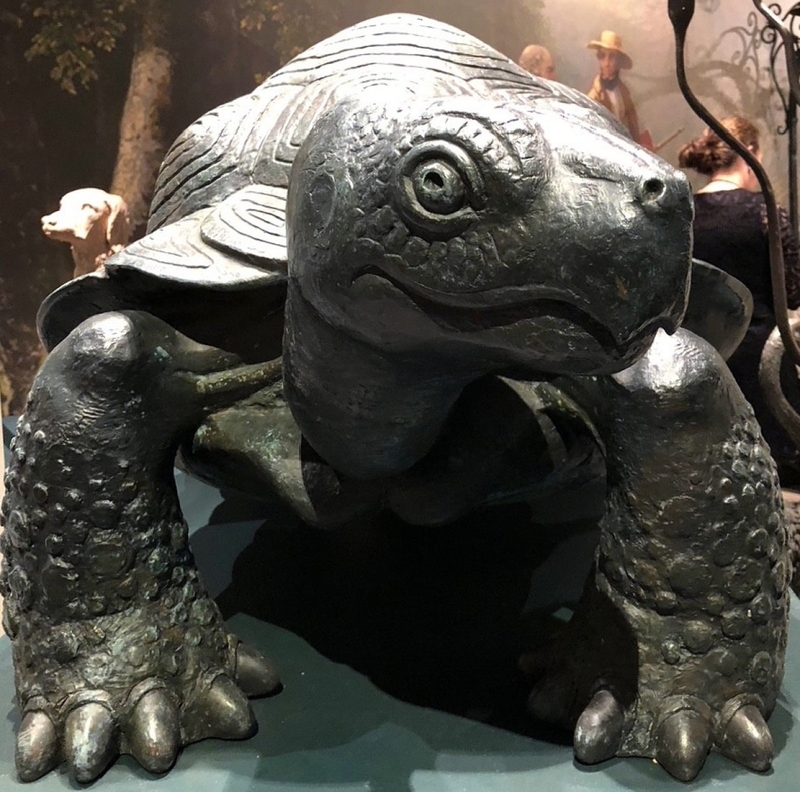 Organizers say attendance, about 23,000, reached a five-year high and that proceeds from ticket sales and events exceeded $800,000. 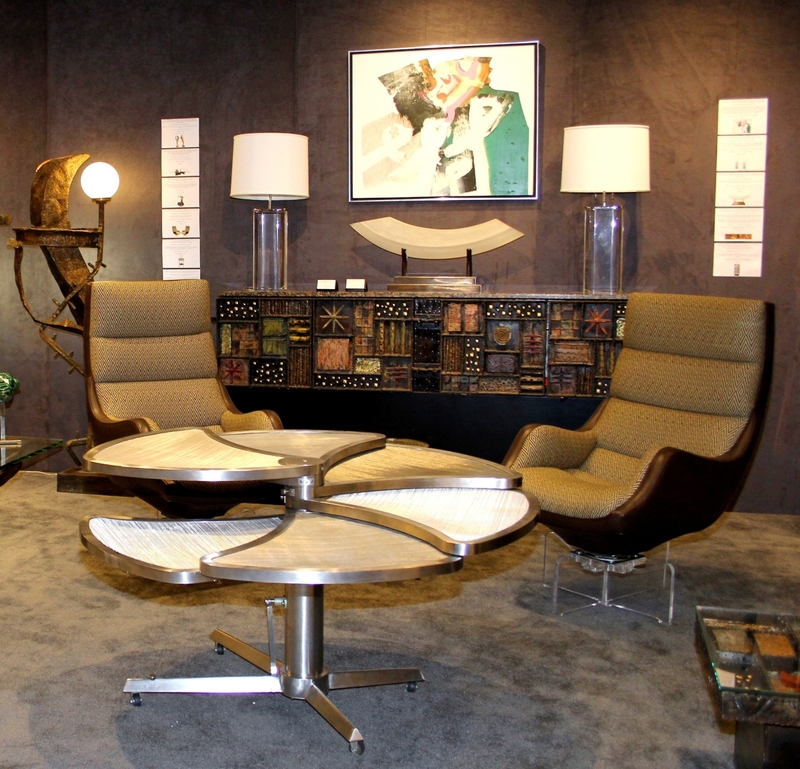 Some exhibitors sold exceedingly well. This year’s loan exhibition from the Virginia Museum of Fine Arts was particularly adept at underscoring the lively, essential connections between collecting and patronage, scholarship and the marketplace. 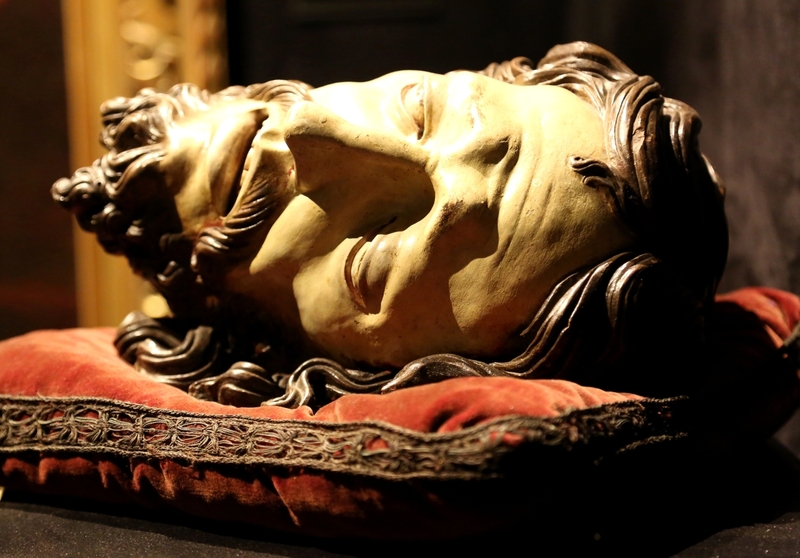 Each year we are reminded that extraordinary objects still lie hidden in plain sight, waiting to be rediscovered by those with knowledge and conviction. 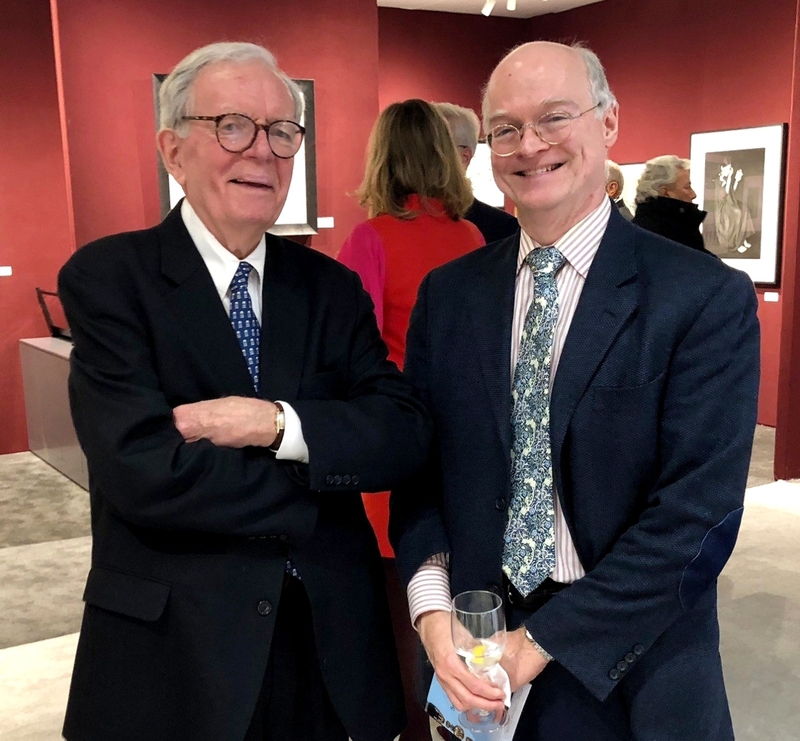 There was no better example of this than at Spencer-Marks, where first-time exhibitors Spencer Gordon and Mark McHugh showcased a pair of Tiffany & Co. iron candlesticks inlaid with gold, silver and copper. 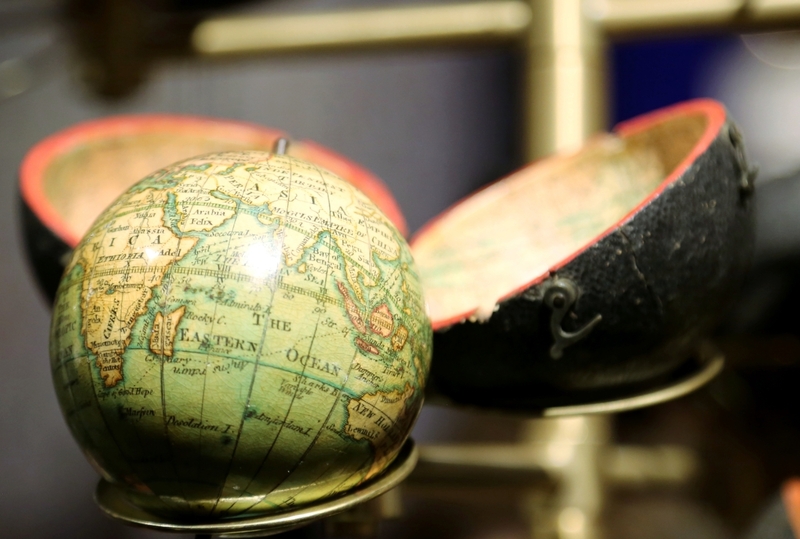 The sticks surfaced in a public setting last year, but it was only by combing the Gorham Company archives at Brown University that Gordon found evidence, in diary entries by Tiffany designer and shop superintendent Charles T. Grosjean, that the objects were completed in 1878 and chosen for display in the Paris Exposition later that year. 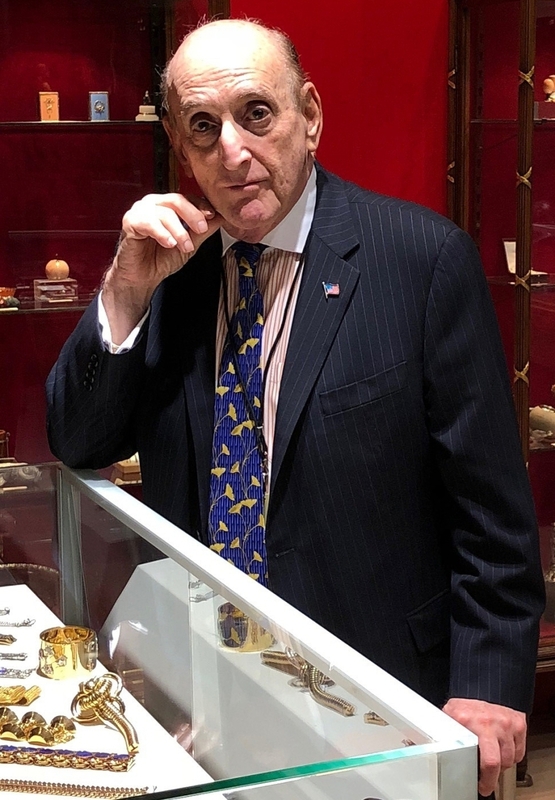 Across the aisle and several booths down, Arthur Liverant was showing a discovery of his own, albeit one he and colleague Kevin Tulimieri made roughly 15 years ago in a house in eastern Connecticut. 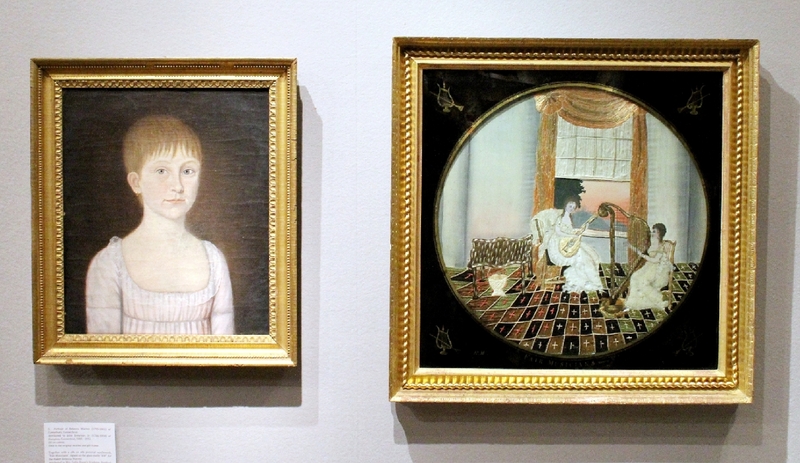 The pieces, newly reacquired and sold opening night, consisted of a portrait, probably by John Brewster Jr, circa 1805, of a shy girl in a pink dress named Rebecca Warren. 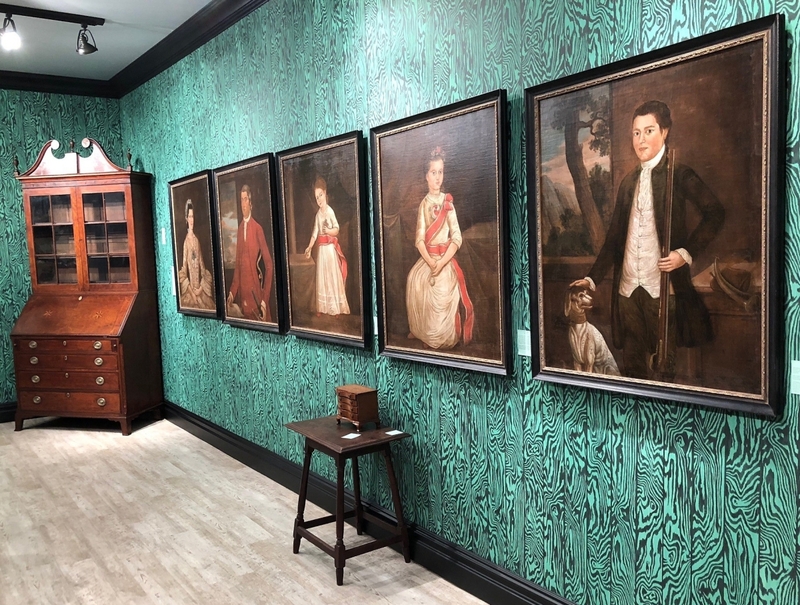 Accompanying the portrait was Rebecca’s circa 1810 silk embroidery, demonstrating refinements she acquired at Miss Royce’s School in Hartford, Conn.
Woodbury, Conn., dealers David Schorsch and Eileen Smiles sold nearly everything pictured here on opening night. 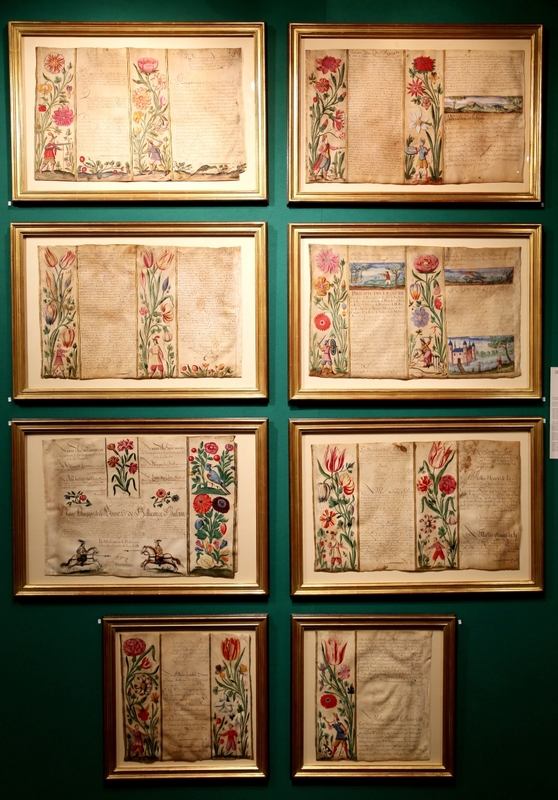 The spectacular album quilt from Pennsylvania or Maryland, circa 1845–55, was gone by fair’s end, as well. “We’ve sold well, enough so that we sent back for more material. 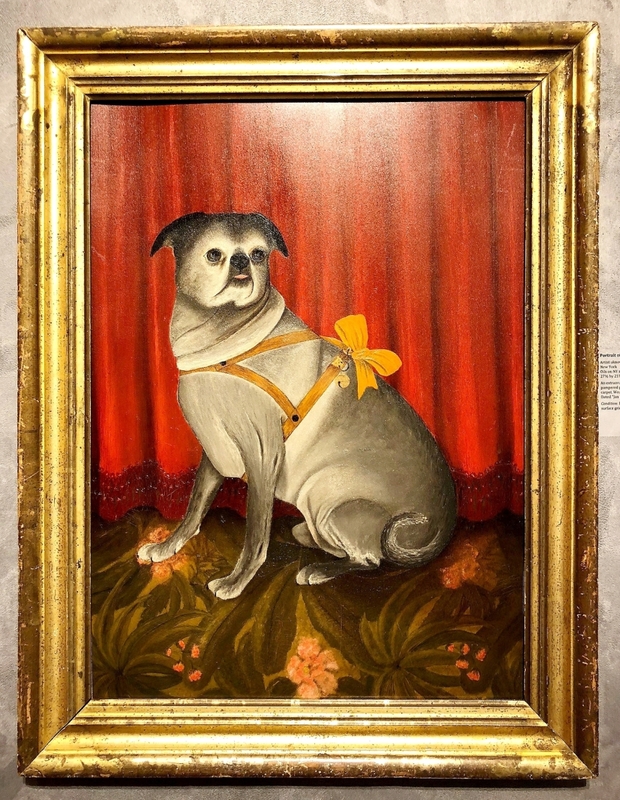 This show takes a lot of planning and it’s not inexpensive to do, but it’s wonderful to be here,” Liverant told us. 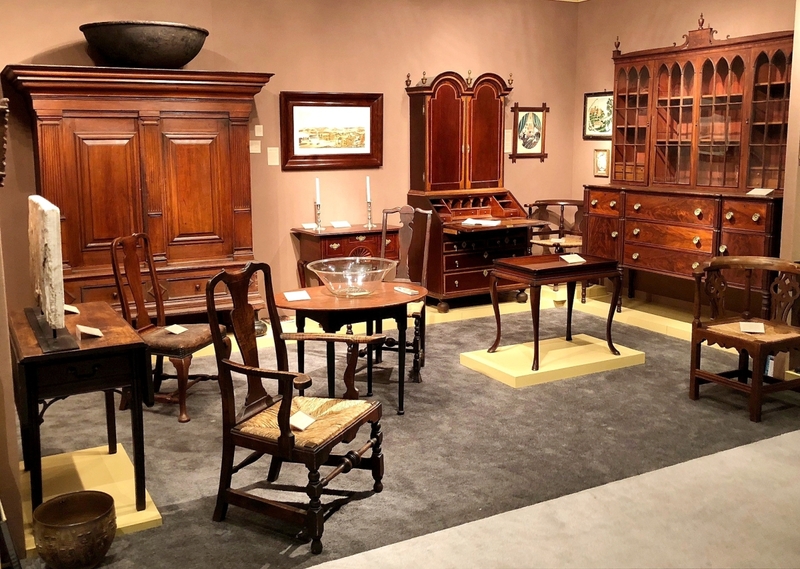 Returning after an absence, Massachusetts dealers Peter Eaton and Joan Brownstein found buyers interested in American furniture and art pottery. 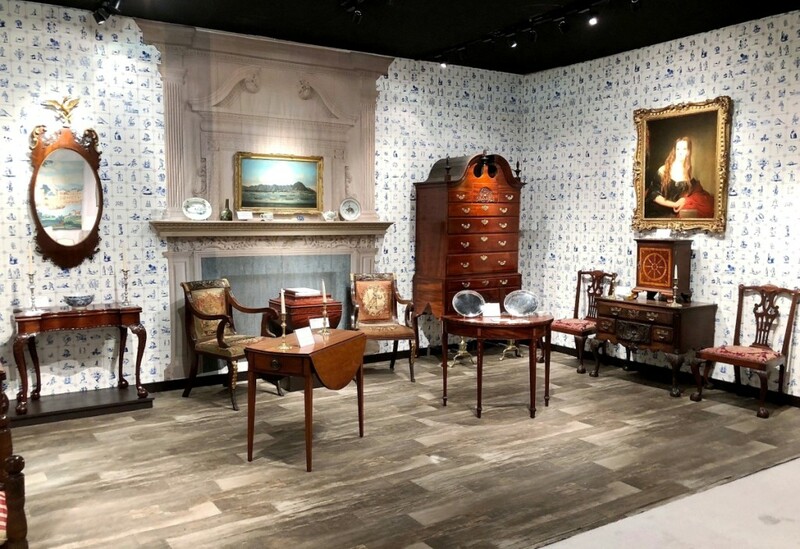 Eaton wrote up a Queen Anne dressing table, a Chester County Pembroke table, his Penniman family desk and bookcase, a miniature four-drawer Chippendale chest and a chiseled marble tavern sign, among other items. 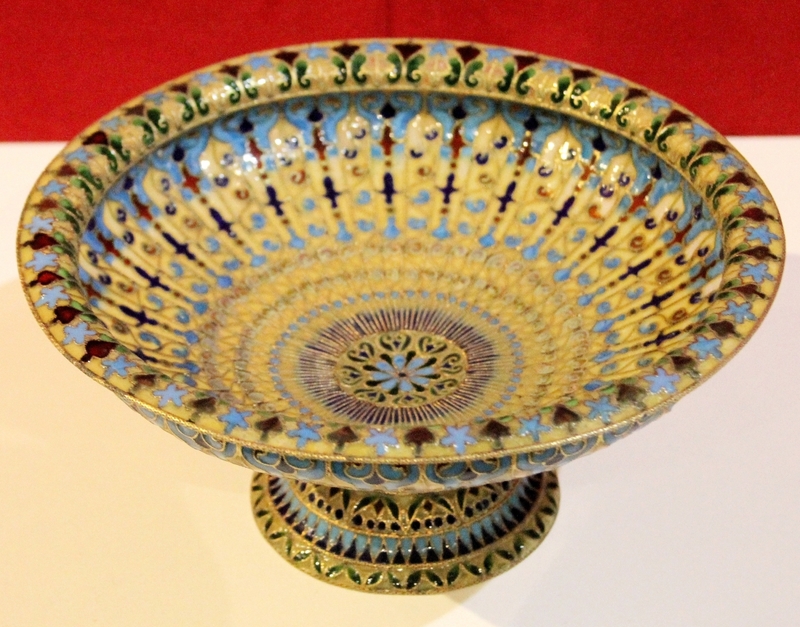 Brownstein parted with American pottery by Sheier and Brother Thomas, along with assorted European pieces. 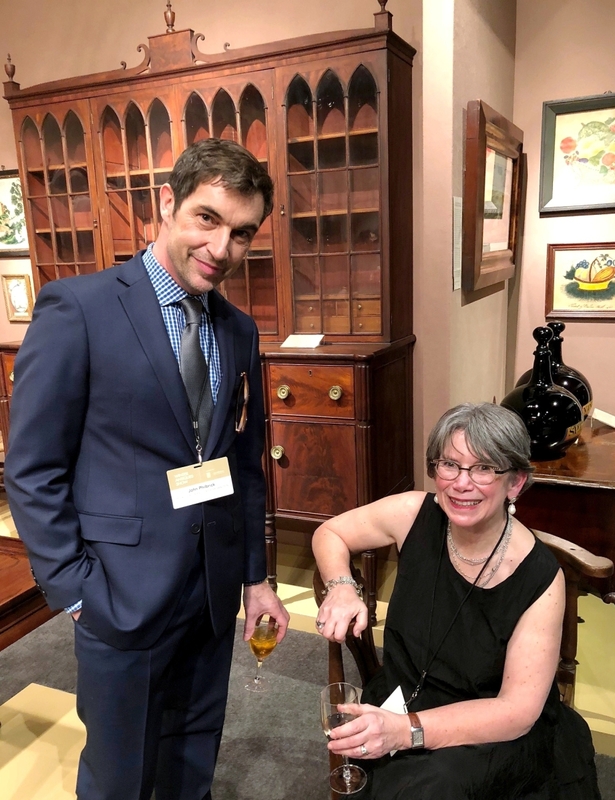 “I’ve had it at home for 25 or 30 years,” Illinois dealer Barbara Pollack said of an Indiana Amish paint-decorated secretary desk inscribed with the names of its makers, Daniel Klich and Noah Lisy. 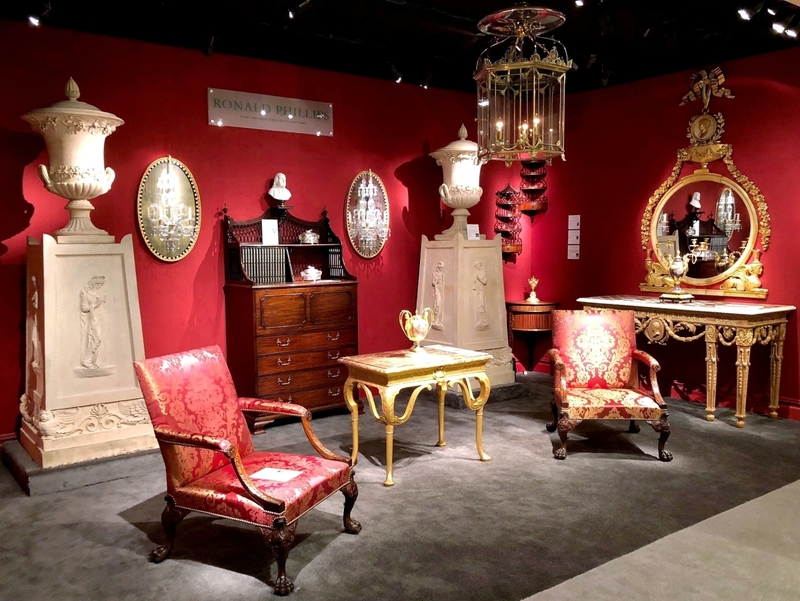 For many exhibitors, the Winter Antiques Show is an opportunity to show their curatorial chops. 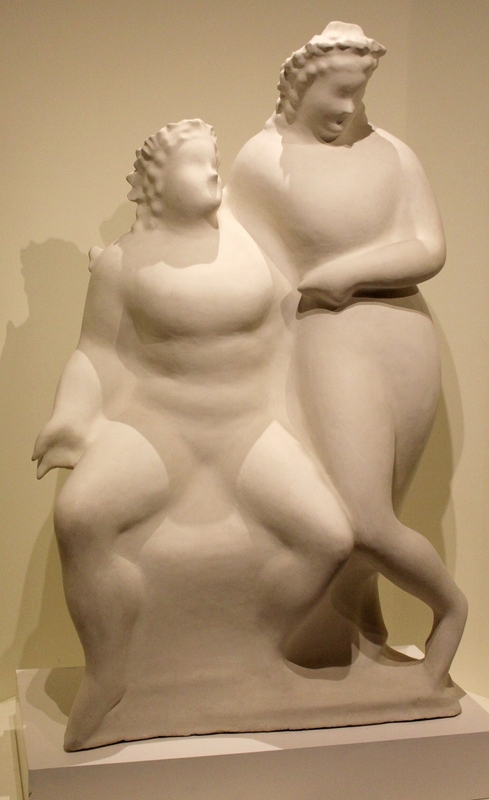 Foremost among these specialists was Joan B. Mirviss, who explored form versus function in post-1960 Japanese pottery and porcelain. 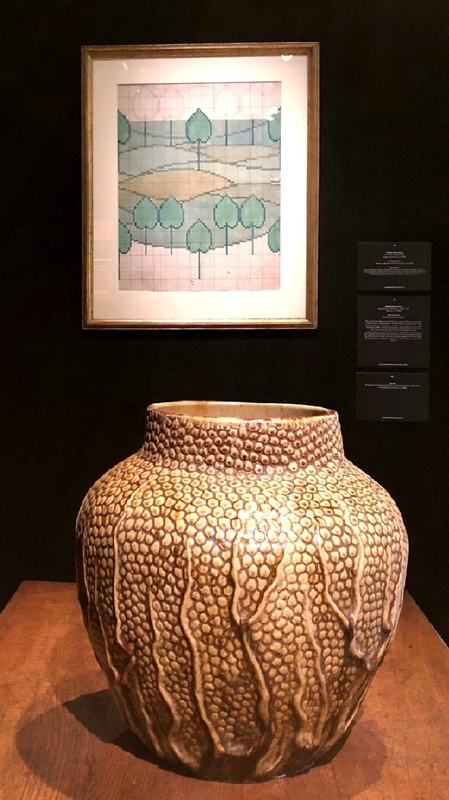 Highlights ranged from a luminous Kutani porcelain platter by Tokuda Yasokichi III (1933-2009) and a Bizen triangular box by Mori Togaku (b 1937) to affordable polka dot decorated tea bowls by the young aritst Takemura Yuri (b 1980). 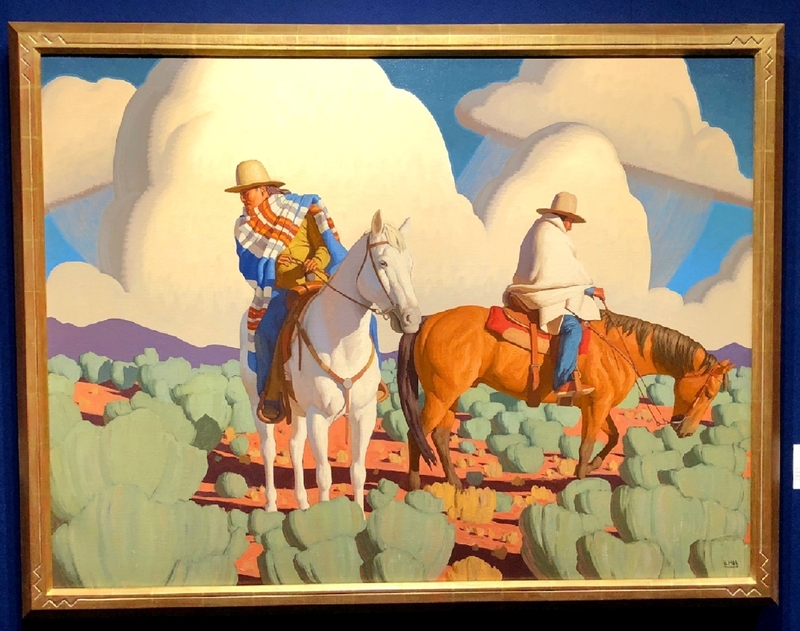 Former museum curator Jason T. Busch brings a deeply scholarly approach to his role as director of the Jason Jacques Gallery. 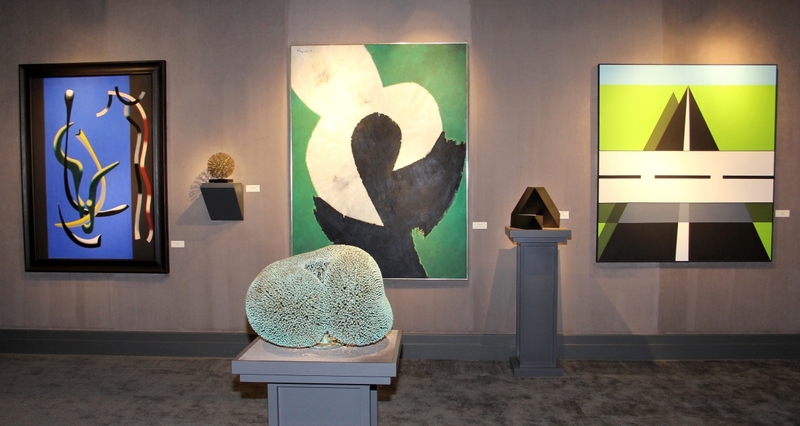 New to the Winter Antiques Show this year, the gallery paired a coveted chimney piece designed by Hector Guimard and metalwork by Frederic Boucheron with contemporary pieces with historical references, among them a spectacularly rococo porcelain installation by Katsuyo Aoki and Shinichiro Kitaura, stag benches by Rick Owens and Beth Cavener’s mixed-media “Rearing Deer,” the latter conjuring visions of a German Jagdschloss. 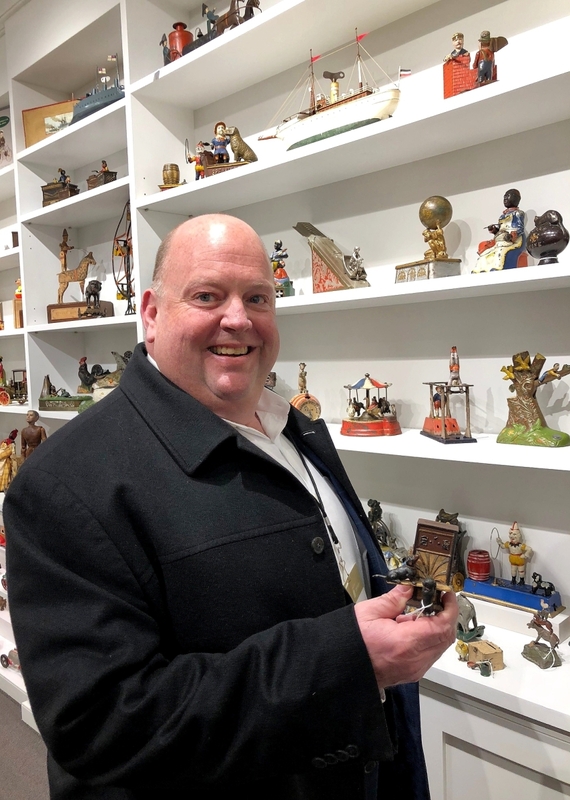 Boston dealer Stephen Score with a few of his favorite things. 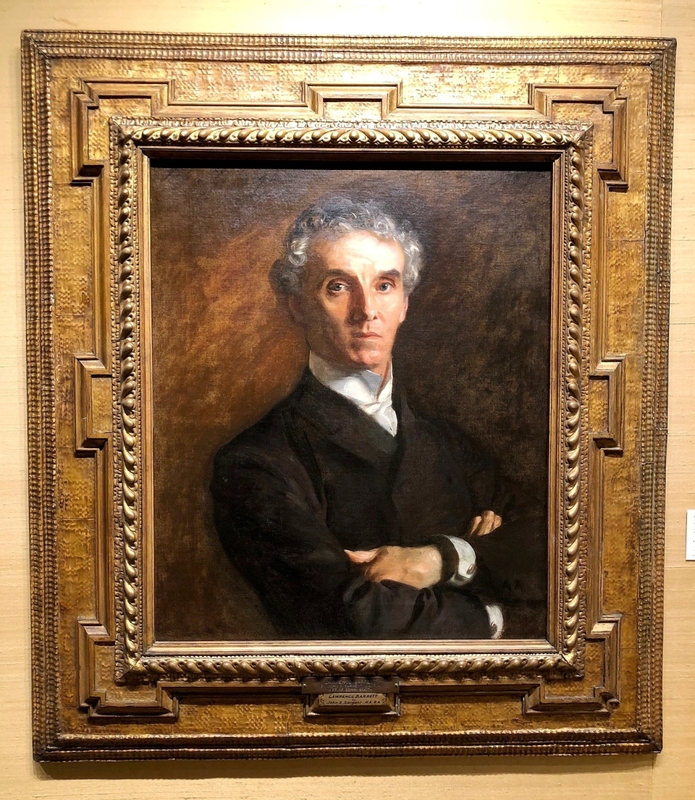 The pastel on paper portrait of young Edward Cooper, later the 83rd mayor of New York City, is by Micah Williams. 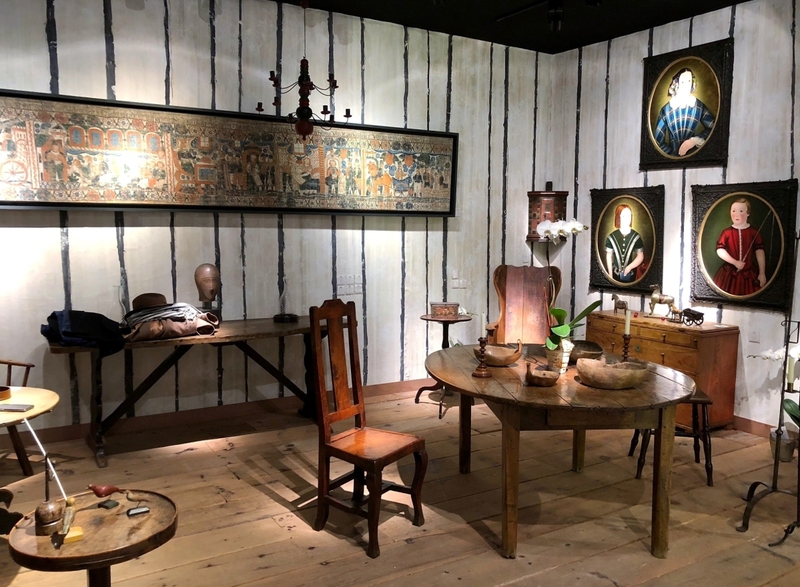 Martin Levy’s erudite approach to proto-modern English and European furniture and works of art makes H. Blairman & Sons a favorite of institutional collectors on both sides of Atlantic. 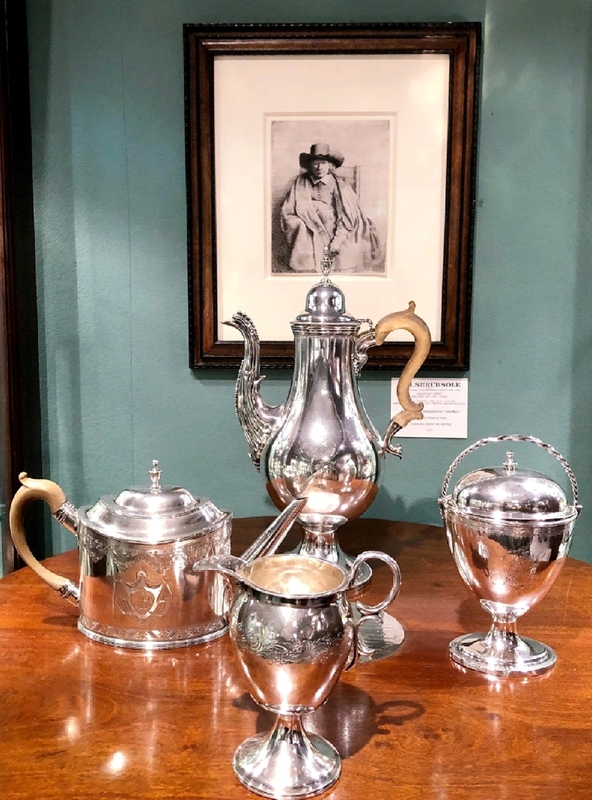 The London antiquary’s appeal is not limited to scholars, however, as illustrated by Levy’s sale to newcomers of a set of French pottery tableware designed by Felix Bracquemond for Eugene Rousseau. 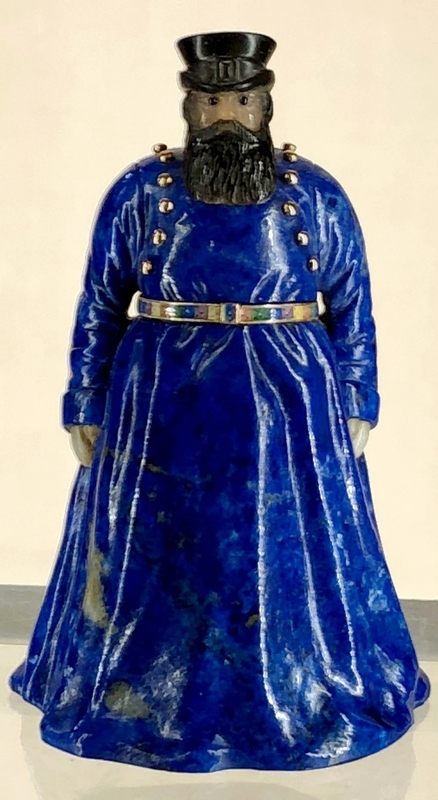 Decidedly French in decoration, the works manufactured by Creil et Montereau between 1866 and 1875 represent an early instance of Japonisme in Europe. 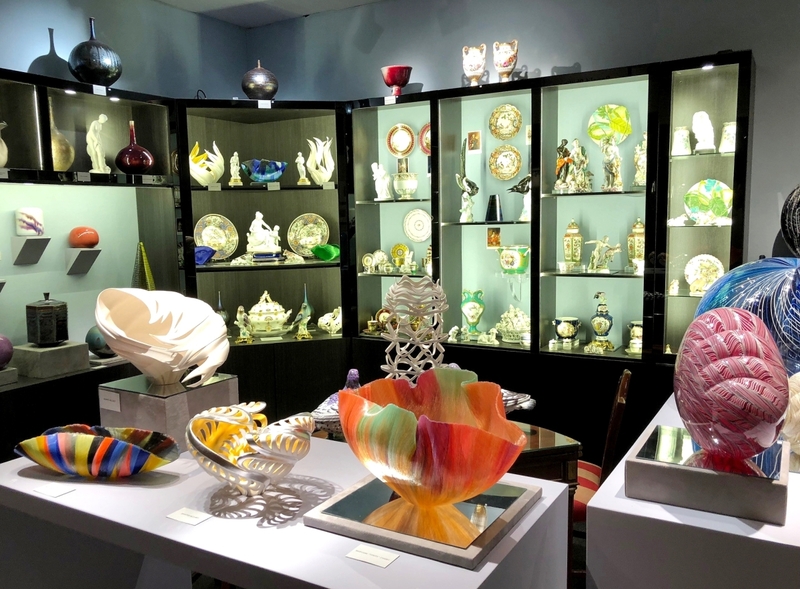 “One of the best reasons for these fairs is the opportunity to meet people and show them things they haven’t seen before,” Levy told us. 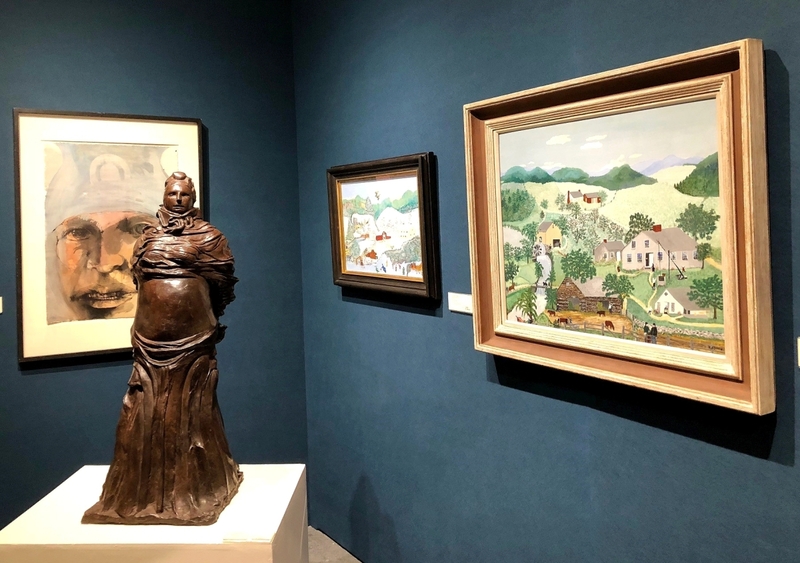 Pairing paintings by the naïve artist Anna Mary Robertson (“Grandma”) Moses (1860-1961) with art by the Yale-trained Leonard Baskin (1922-2000) may seem counterintuitive, but Galerie St Etienne made it work, showing 1940s oil paintings on signature Moses themes alongside bronzes and watercolors by Baskin. 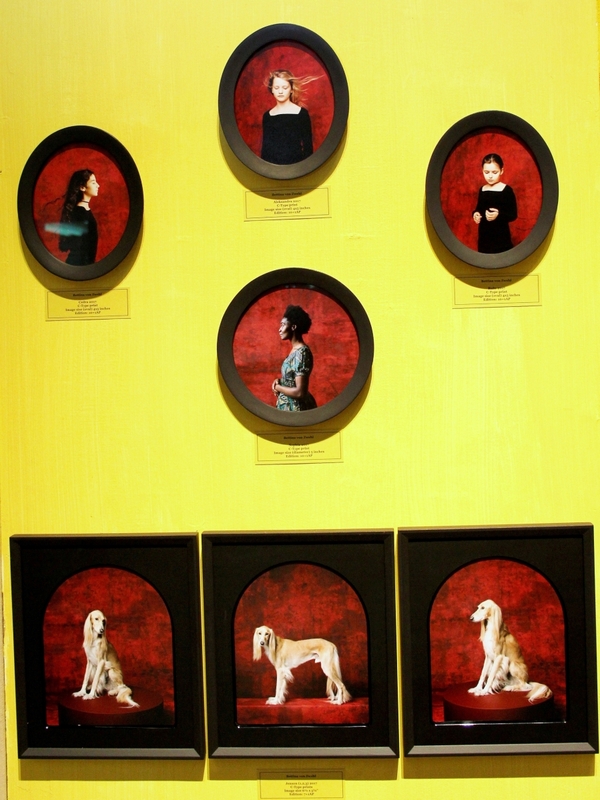 Three Moses paintings sold. 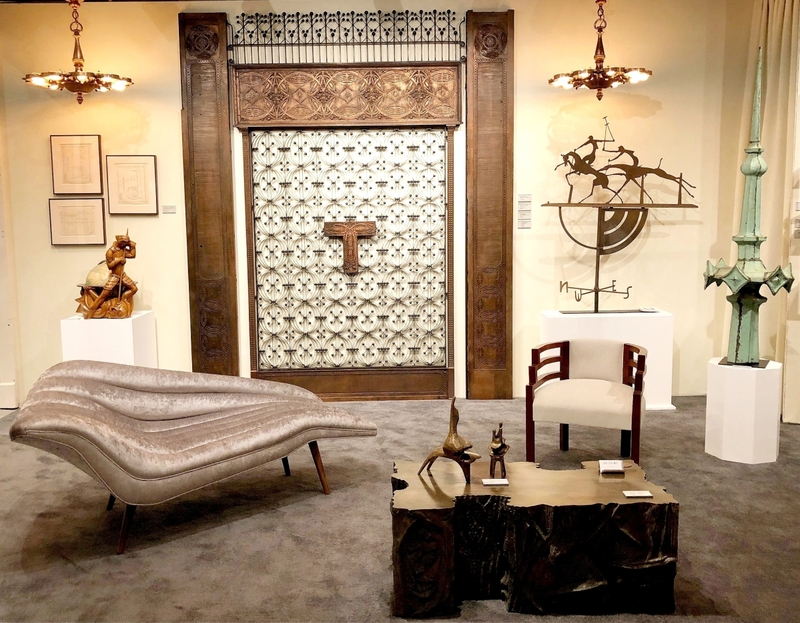 Coinciding with the show, Tillou Gallery published The Ann and Joel Finn Collection, highlighting significant furniture and paintings assembled by Ann Smith Finn, former director of the Mattatuck Museum, and her late husband, Joel. 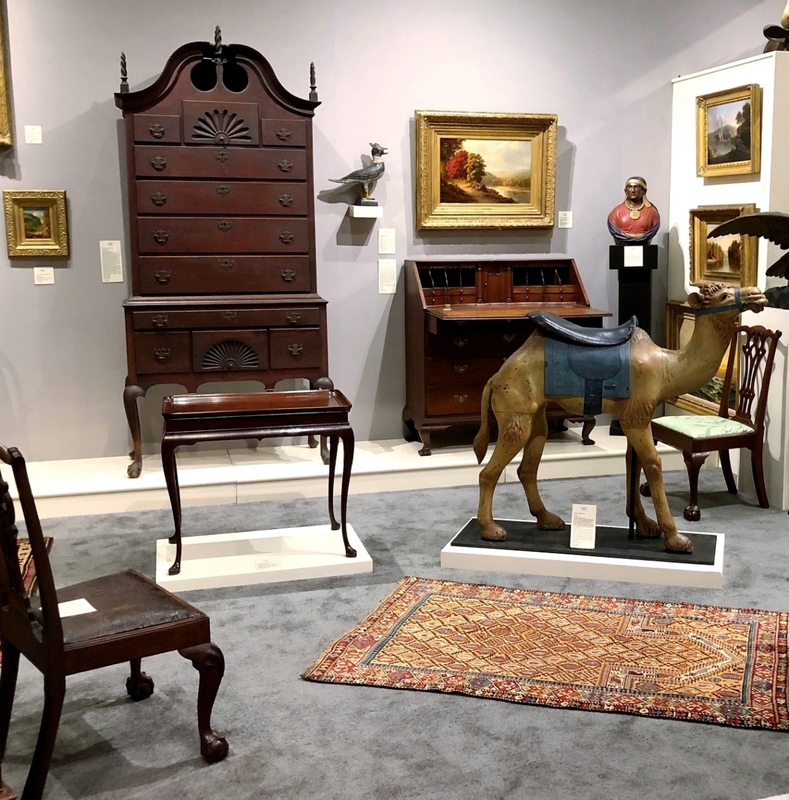 The Litchfield, Conn., dealer presented a handful of Finn pieces, chief among them a classic Woodbury Chippendale bonnet-top highboy with deeply carved shells and a vivid still life of fruit in its original shadow-box frame by Levi Wells Prentice (1851-1935). 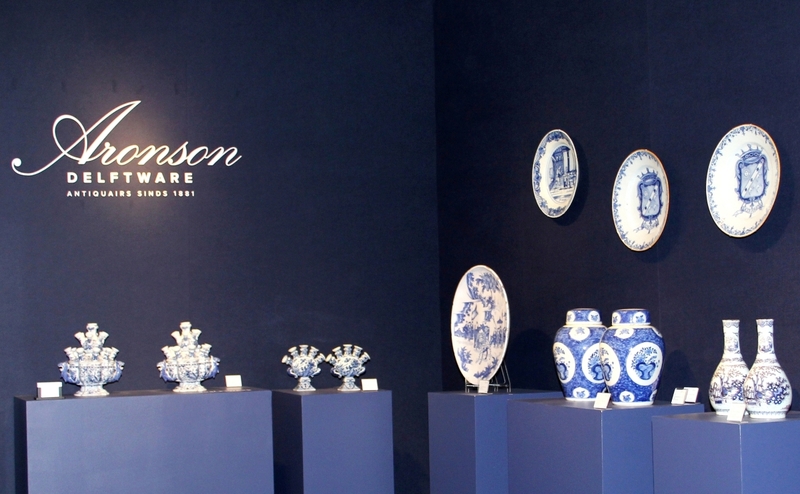 Boston dealer Stephen Score and his painter wife, Eleanor, known as a colorist, brought a Matissian joie de vivre to their presentation, featuring an irresistible blue and white cupboard decorated by the Cape Cod folk artist Peter Hunt (1896-1967) with an 1860s Pennsylvania quilt festooned with a bright yellow pinwheel and tulips on a red ground. 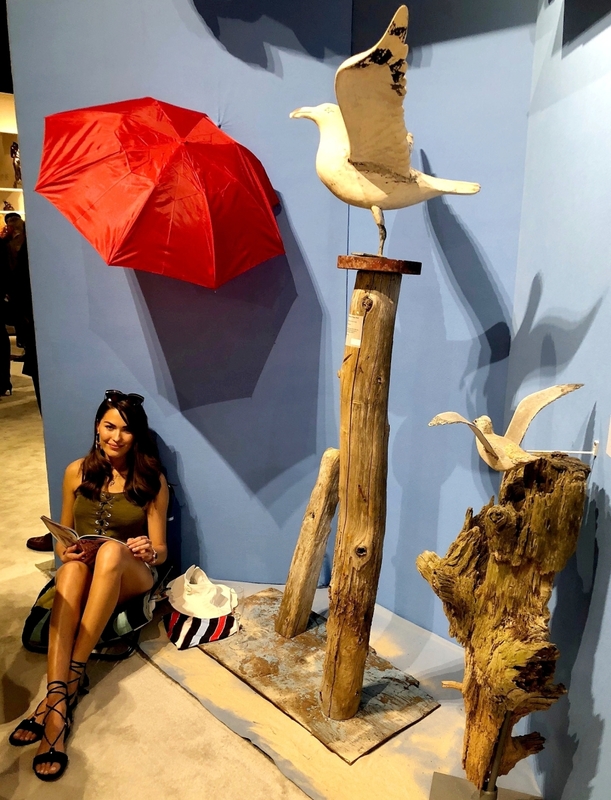 Topping it off was Score’s opening night tableau vivant consisting of a young woman reading on a sandy beach. 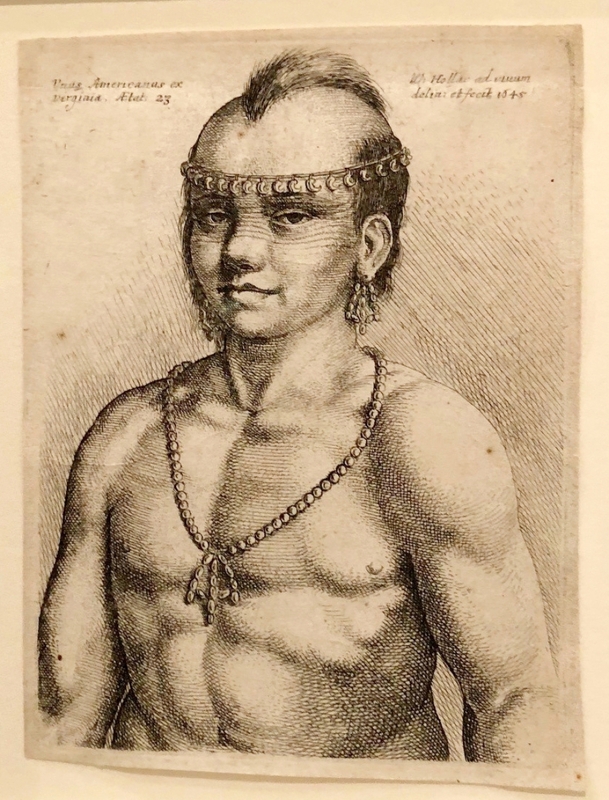 Score, a spiritual successor to the Nineteenth Century antiquarian Henry Davis Sleeper, who treated his Gloucester, Mass., mansion, Beauport, as a stage for creating atmospheres with objects, said the Americana field needs to rediscover the sense of playfulness and adventure that animated it in its early years. 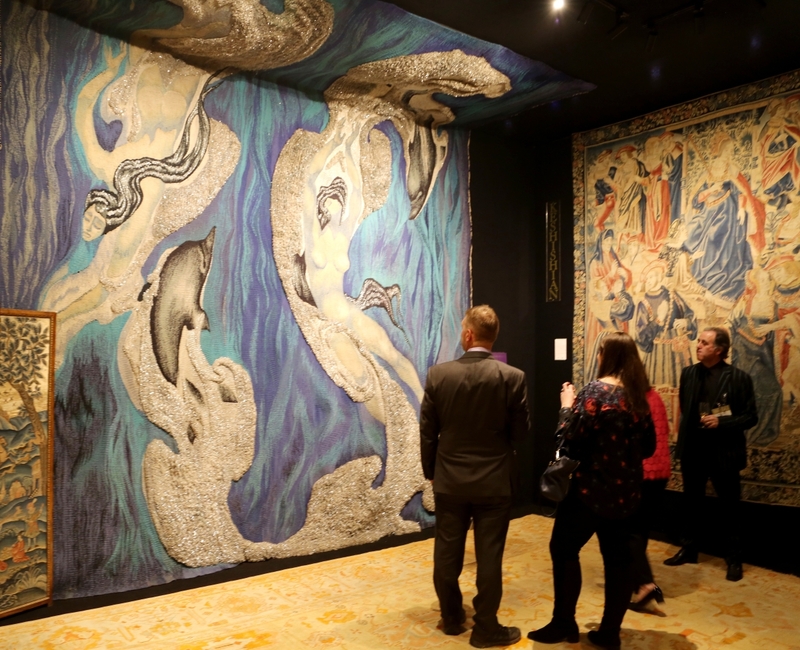 On the subject of quilts, a recent feature story on Maryland dealer Stella Rubin in Architectural Digest and a New York Times report on the collecting interests of documentarian Ken Burns have declared the graphic bedcoverings back in vogue. 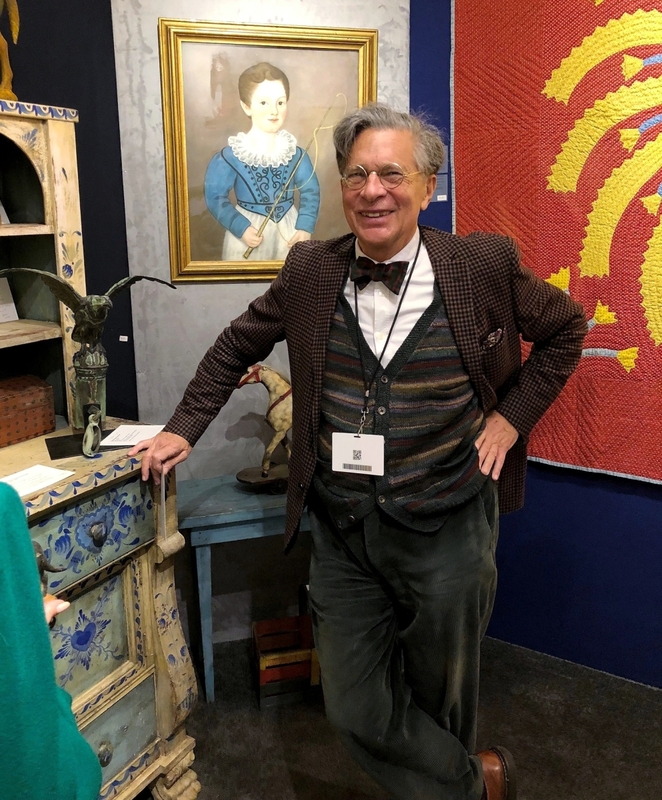 Places to see great examples were Olde Hope Antiques, which hung “The Union Star” quilt, an 1859 patriotic textile made south of the Mason-Dixon line, and at David Schorsch and Eileen Smiles, who featured a circa 1845 Mid-Atlantic album quilt with voluptuous stuffwork detail. 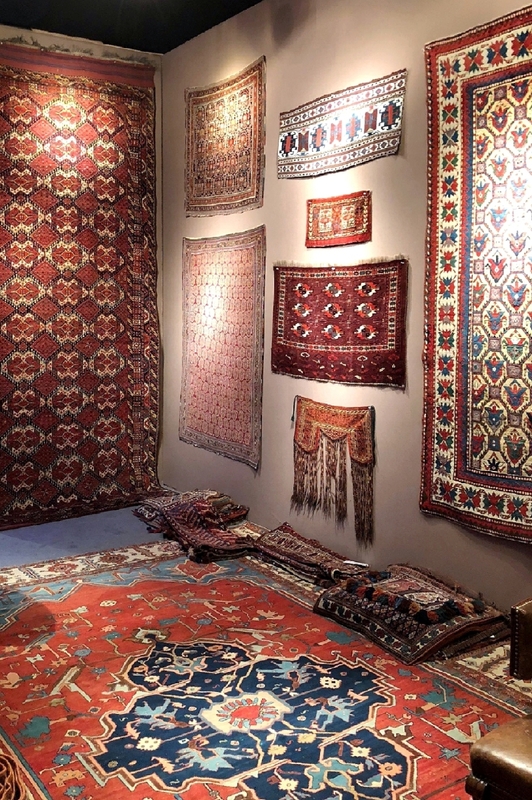 “Quality and price. 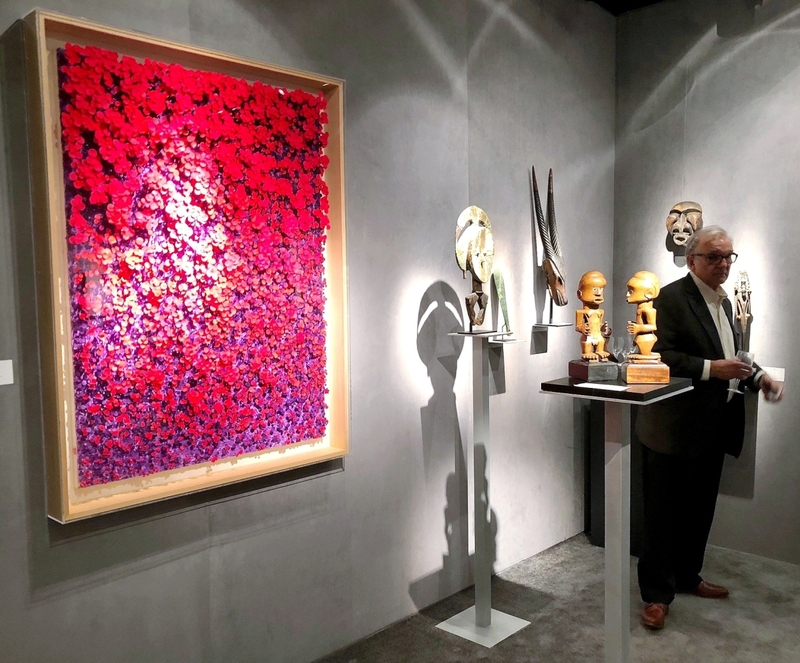 It’s been an incredible show,” David Schorsch told us, surveying his nearly sold-out booth on opening night. 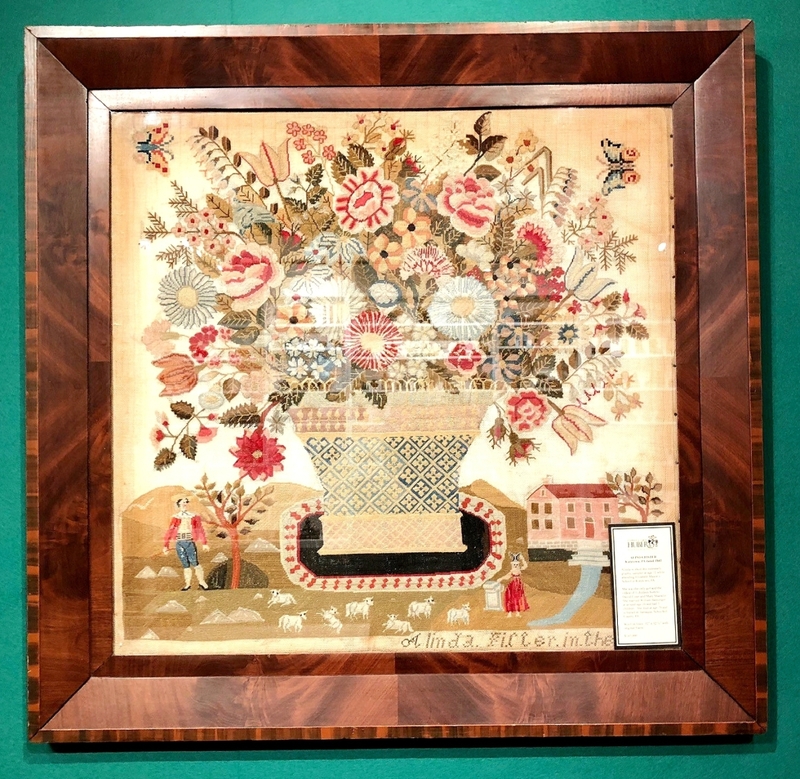 The quilt sold Wednesday afternoon to a collector who visited the show over the weekend. 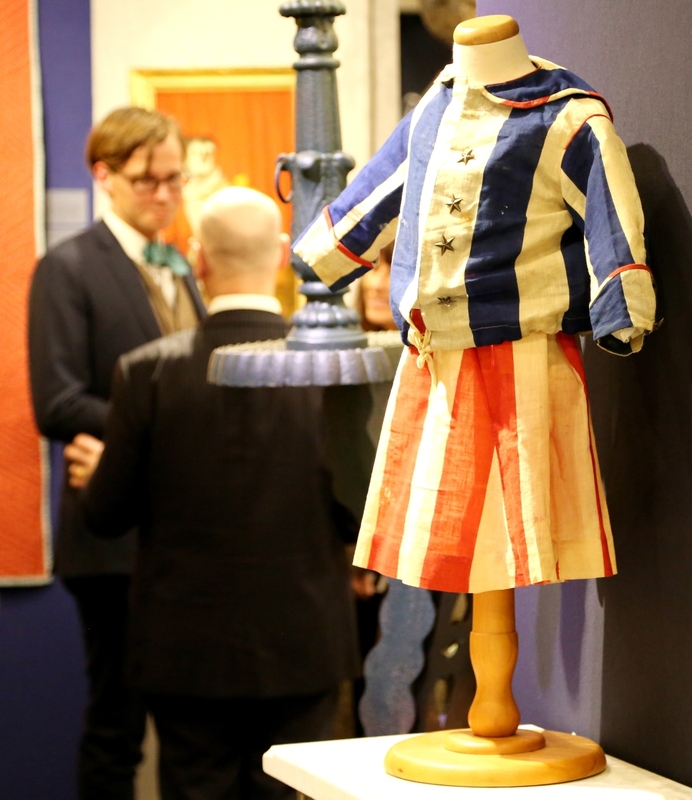 Patriotic Americana is always a draw, but allusions to a more civil society seem to be in deep demand these days. 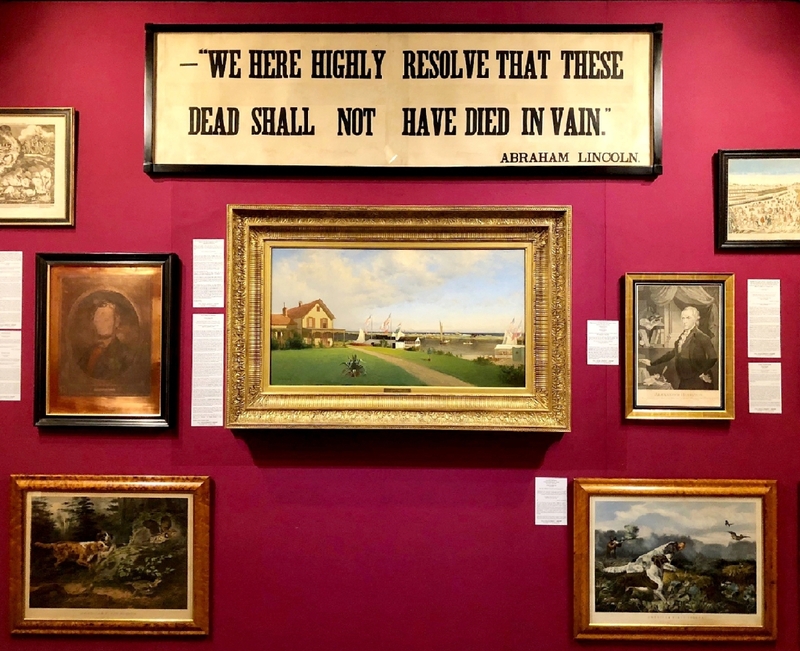 Alexander Gallery met the need with busts of Benjamin Franklin and George Washington, accompanied by portraits in various sizes of Washington and Zachary Taylor. 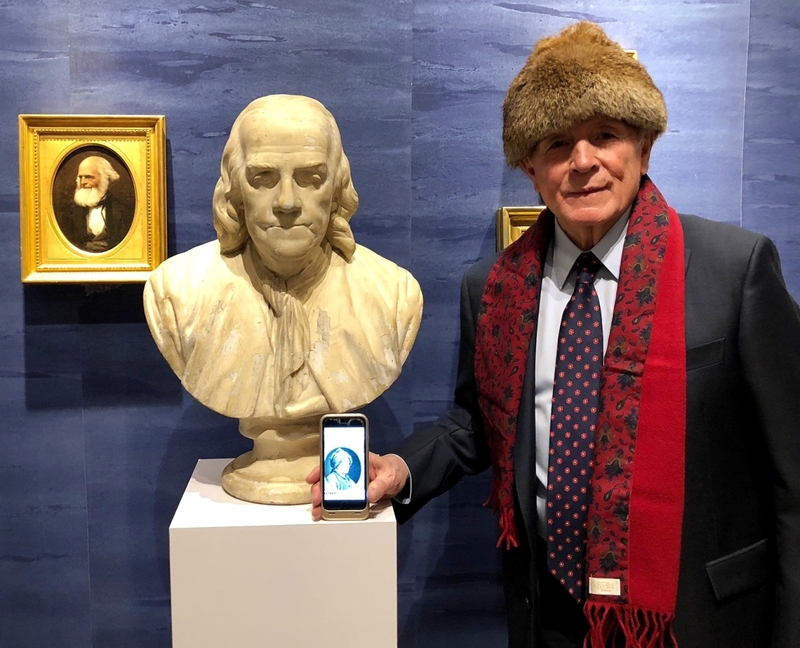 We hope some determined patent attorney snapped up the earliest known patent, dated 1793 and signed by George Washington and Thomas Jefferson, also in Alexander Gallery’s booth. 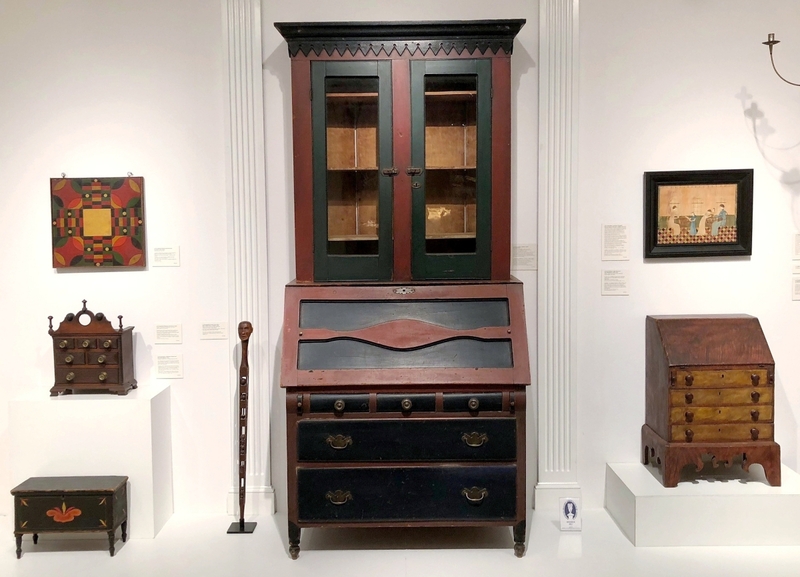 Kelly Kinzle, meanwhile, featured a Pennsylvania sideboard inlaid with patriotic symbols by Harrison Webber around 1900. 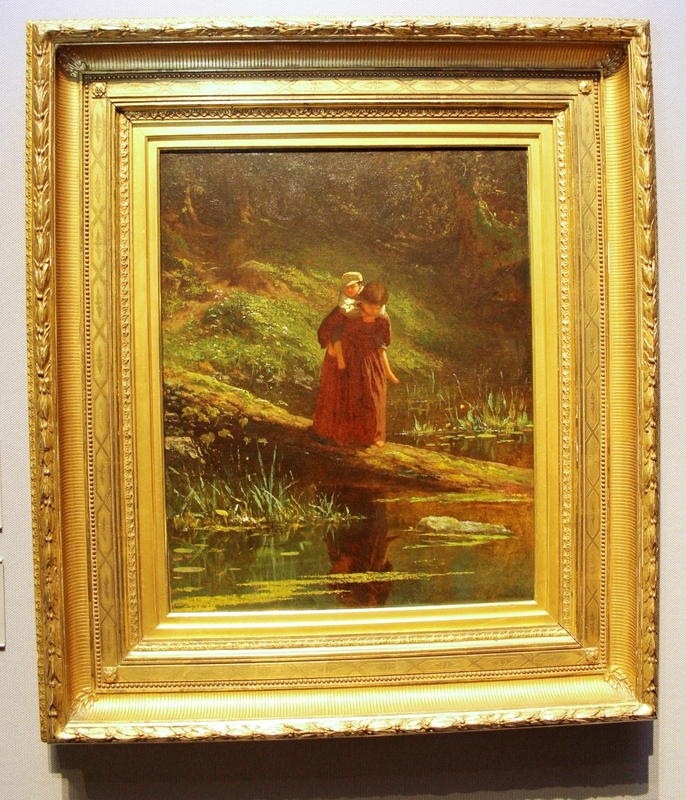 Highlights offered by dealers in American art included “Crossing A Stream (Pig-a-Back)” by Eastman Johnson, 1866, at Thomas Colville Fine Art; “Two Circus Women” by Elie Nadelman, circa 1928–29, at Bernard Goldberg Fine Arts; “Lawrence Barrett” by John Singer Sargent, 1890, at Adelson Galleries; “View of West Point from Fort Putnam” by David Johnson, 1867, at Hirschl & Adler Galleries; portraits of the Seabrook family of Henrico and Hanover Counties, Va., attributed to the Payne Limner, active 1780-1803, at Kelly Kinzle; and side-by-side paintings by Bellows and Hartley at Michael Altman Fine Art. 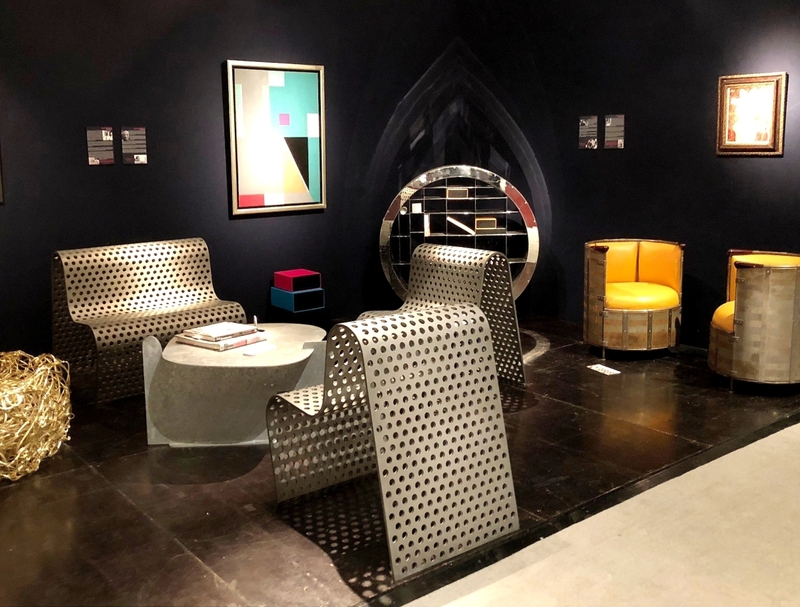 Jonathan Boos balanced mid-Twentieth Century paintings by John D. Graham, Charles D. Shaw and Allan D’Arcangelo against sculpture by Harry Bertoia and Tony Smith. 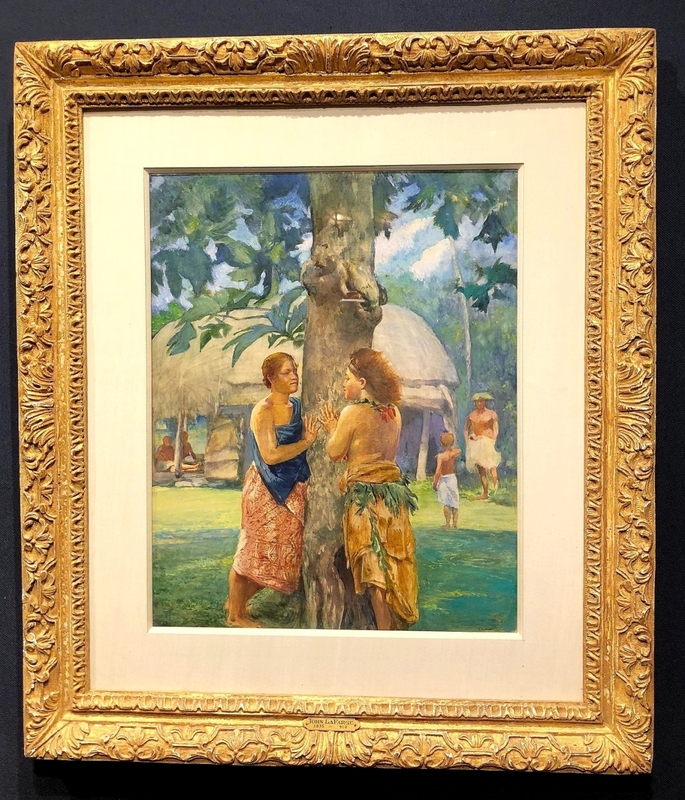 Menconi + Schoelkopf featured a sparking 1891 John La Farge watercolor of a Samoan subject. 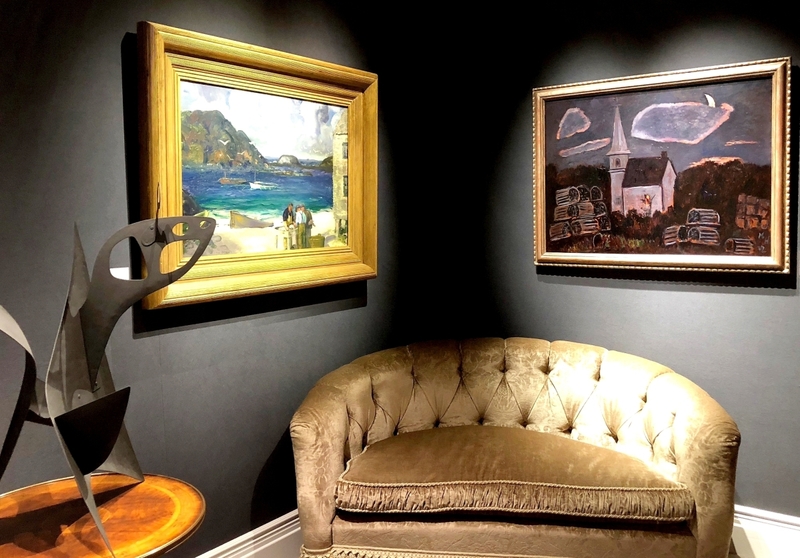 The first-time exhibitors sold works by Burchfield, Henri, Marin, Maurice Prendergast and Shinn. 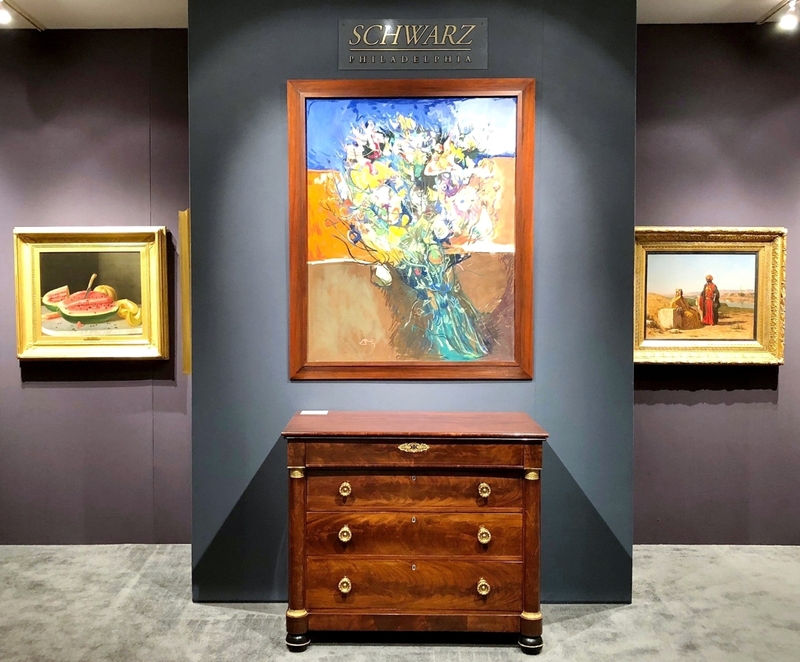 Schwarz Gallery sold its lush pastel “Imaginary Bouquet” by Leon Kelly, an artist associated with the Pennsylvania Academy of the Fine Arts. A splashing fountain at Barbara Israel Garden Antiques seemed a choice metaphor for a presentation burbling with interest. 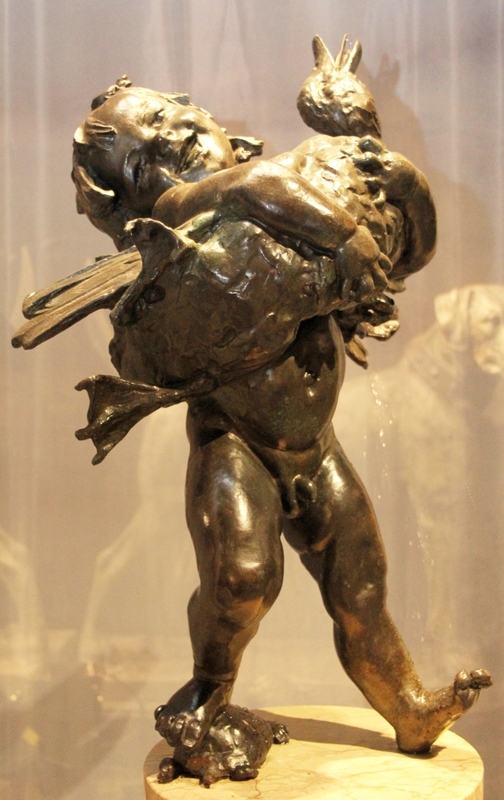 The New York dealer’s many sales included the fountain figure “Boy and Duck,” modeled in 1897 by Frederick MacMonnies and cast by Roman Bronze Works between 1902 and 1907; a life-size bronze giant tortoise, cast in 1998 from a 1916 plaster by Paul Manship; and a pair of zinc short-haired guard dogs marked J.W. Fiske. 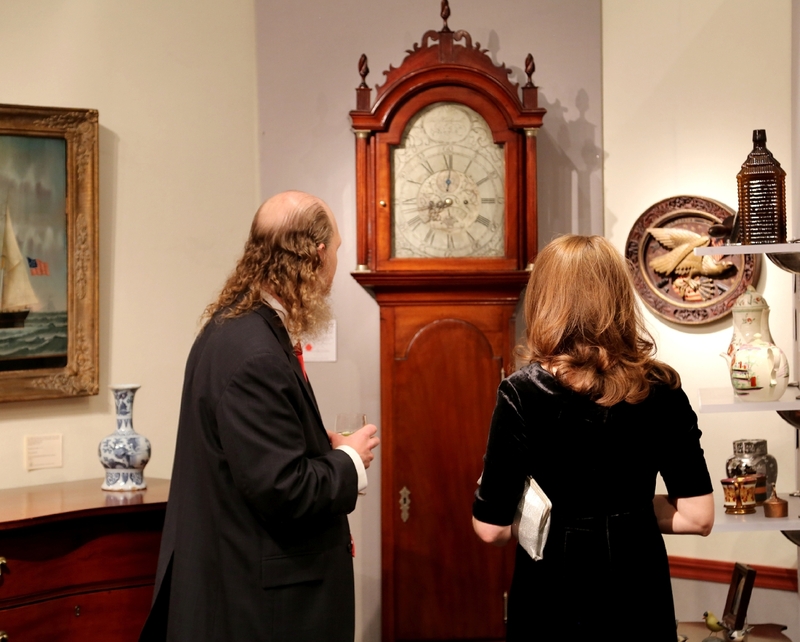 Israel’s favorite piece, an allegorical figure of Autumn by Coade, is returning to England, where it was made. 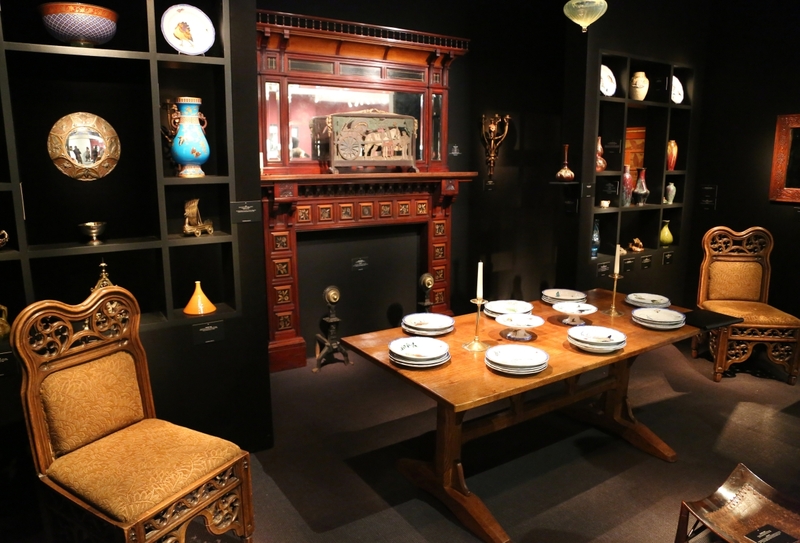 Other sales of note include an Eighteenth Century view of the British surrender at Yorktown and the Audubon print “Snowy Heron” at the Old Print Shop; a carved and gilt console table in the form of an eagle and a green glass chandelier at Apter-Fredericks; two fan-shape flower vases at Aronson of Amsterdam; a “Tao Cabinet” in bronze and pewter by Philip and Kelvin LaVerne at Lobel Modern; and George and Walter Bromley’s Atlas of the City of New York – Borough of Manhattan, 1908, to a New York-based private collector at Daniel Crouch Rare Books. 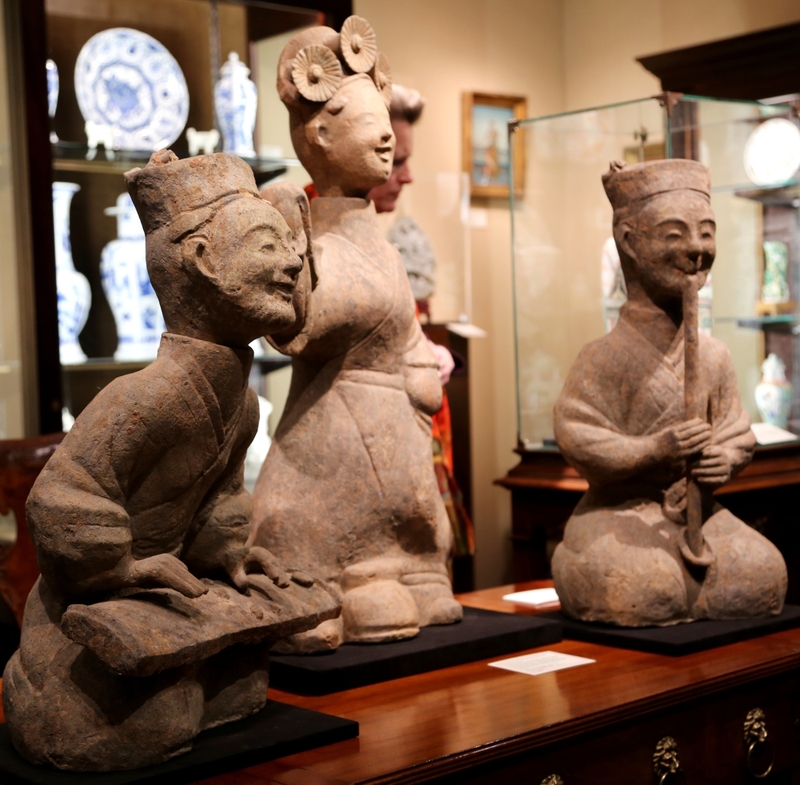 Young Collectors Night on January 25 proved especially successful. 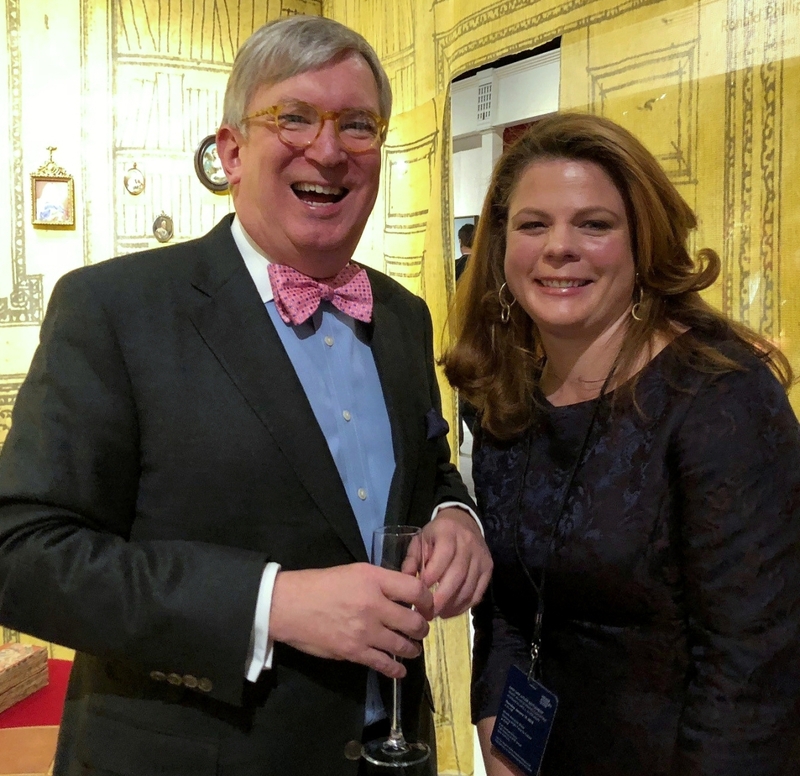 Hosted by honorary chair Zac Posen, creative director of Brooks Brothers women’s collection, and attended by design chairs Thomas Jayne, Wendy Goodman and Gil Schafer, it attracted 900 guests, the most ever. 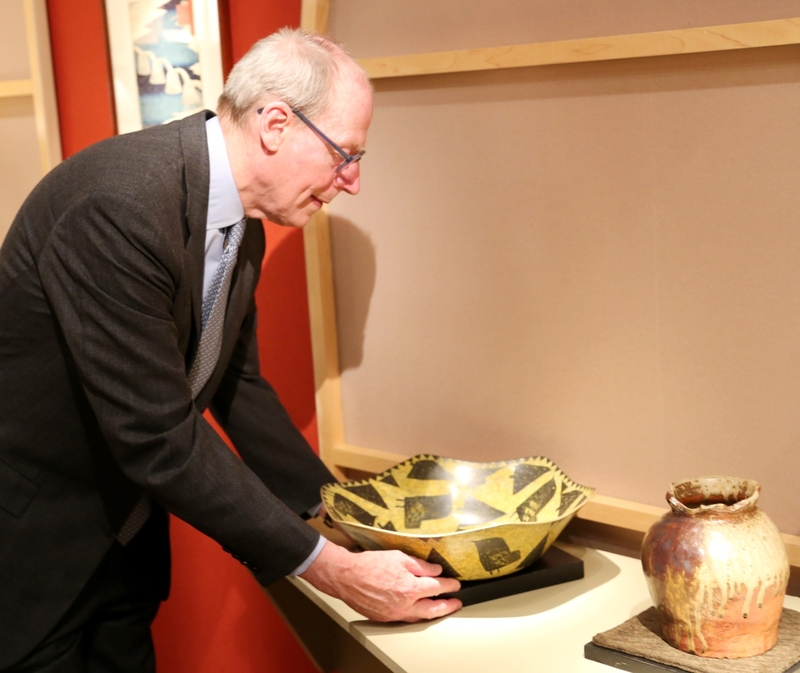 “It was a success because the participants were closer to the objects. 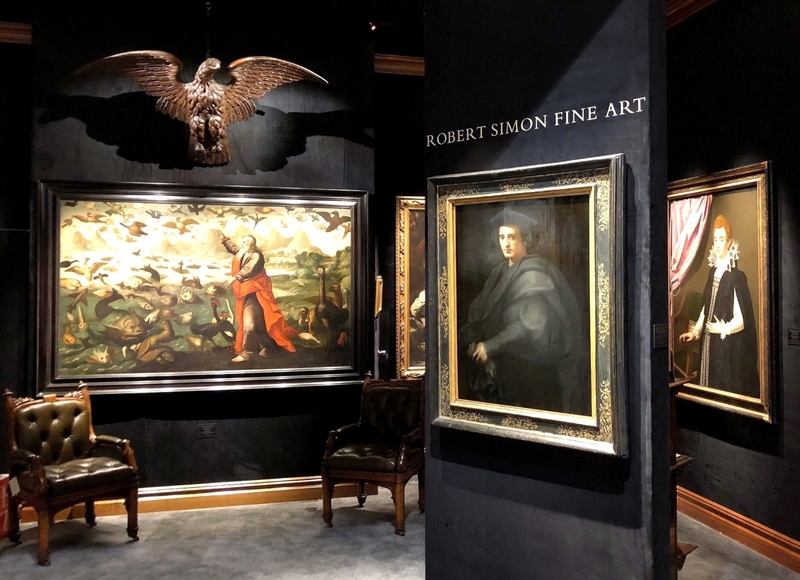 The event is an opportunity to sell to a targeted demographic, but it is also about exposure – exposing a new audience to the material at the show. 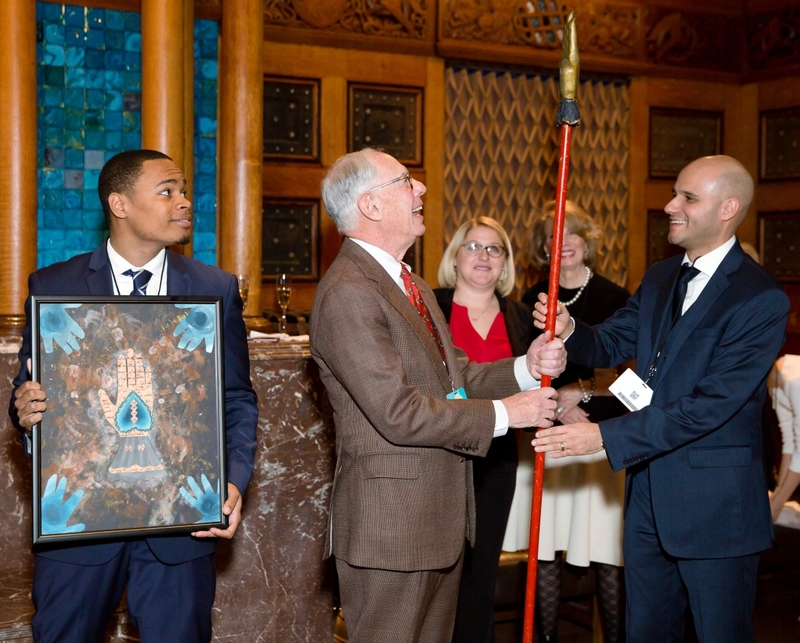 Because of the nature of young patrons events, they are always about hooking an ever-renewing audience. The work never ends. 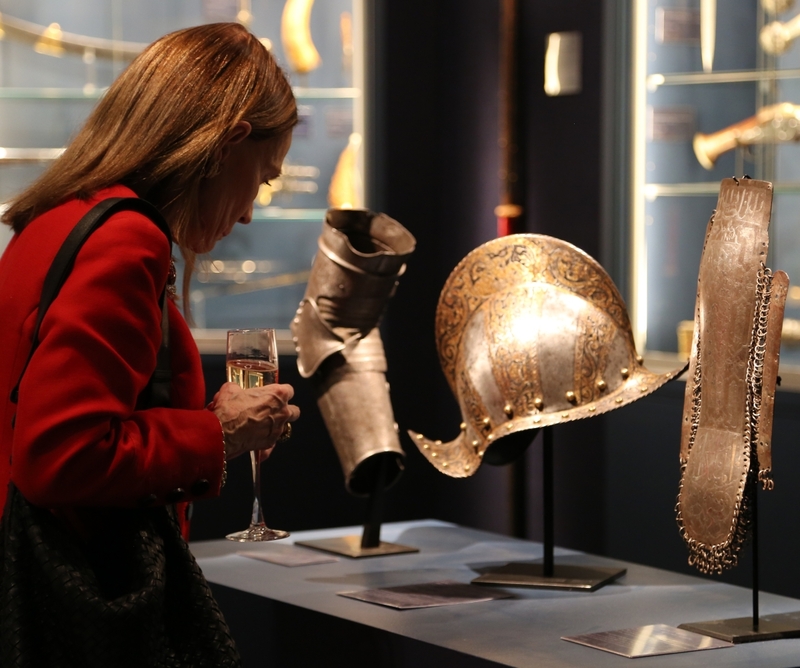 Someone who did not buy this year may begin collecting two years from now – at the opening night party,” reported Michael Diaz-Griffith, the show’s associate executive director. 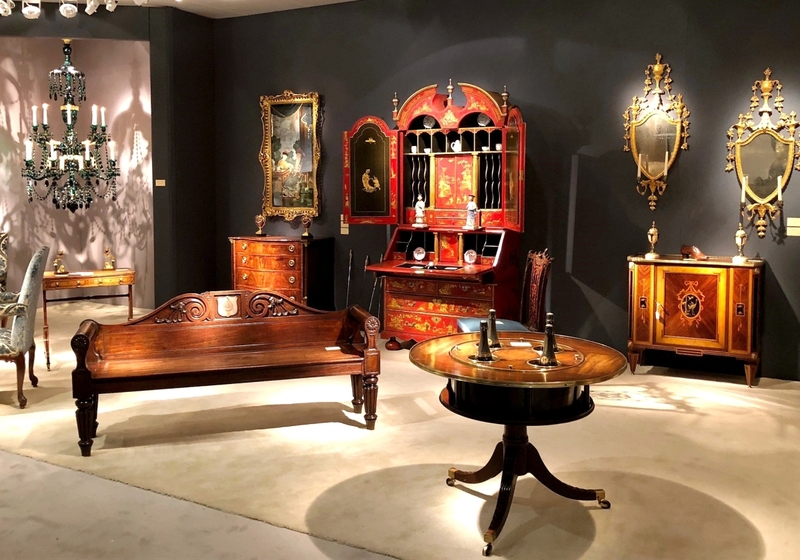 The 2019 Winter Antiques Show is planned for January 18-27, with a January 17 preview. 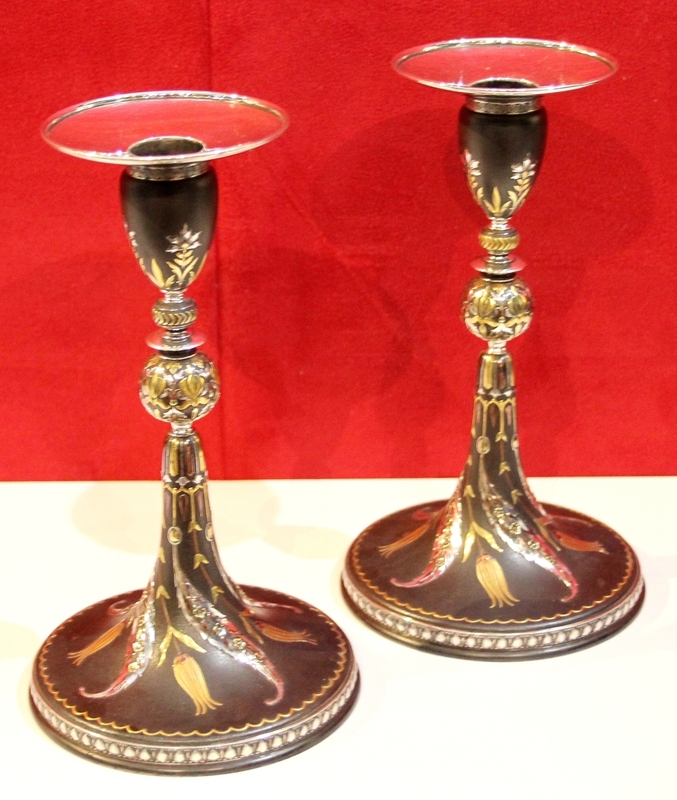 For additional information, visit www.winterantiquesshow.com or call 646-740-1976. 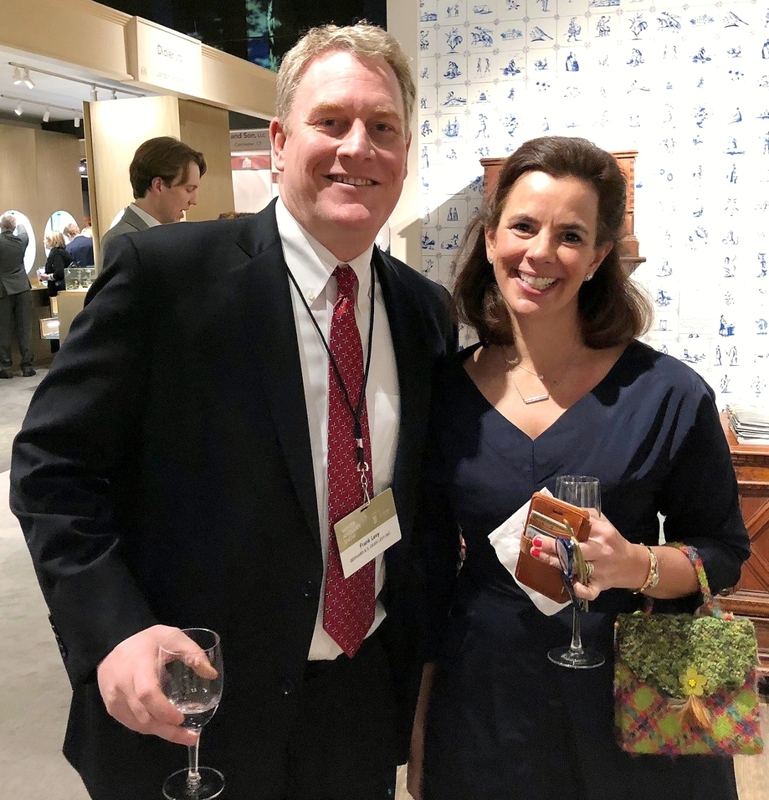 Catherine Sweeney Singer, executive director, and Michael Diaz-Griffith, associate executive director, Winter Antiques Show.